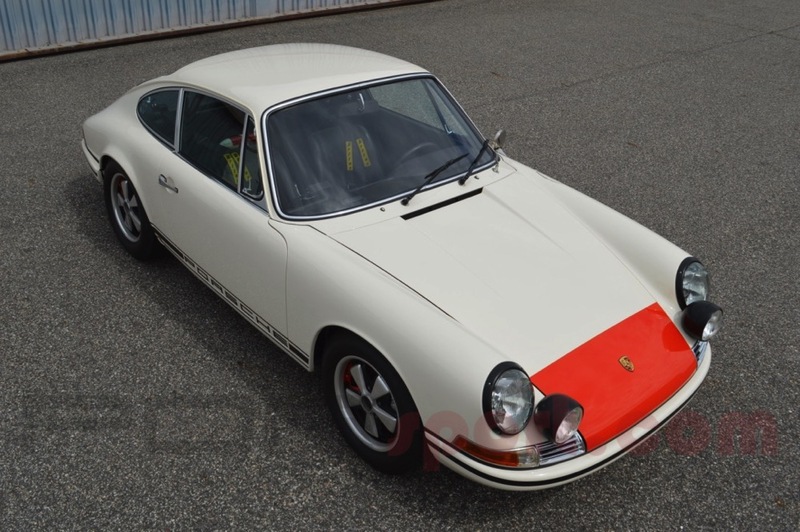 The 911T in 1968 was the lightest 911 making it ideal for racing in Europe where the SWB T was homologated for Group 3 competition. 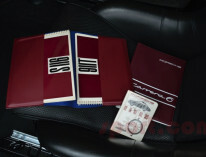 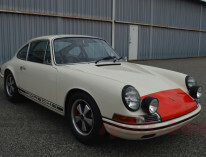 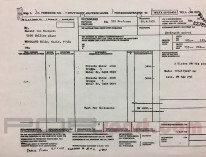 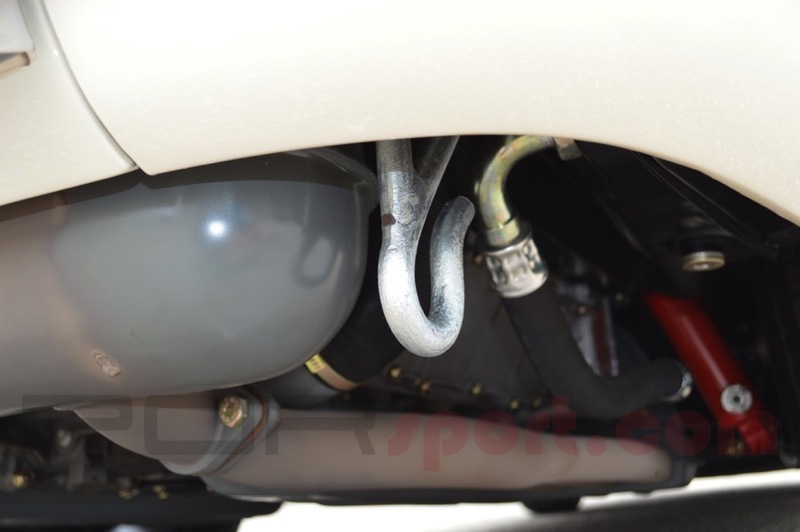 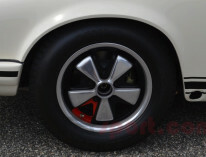 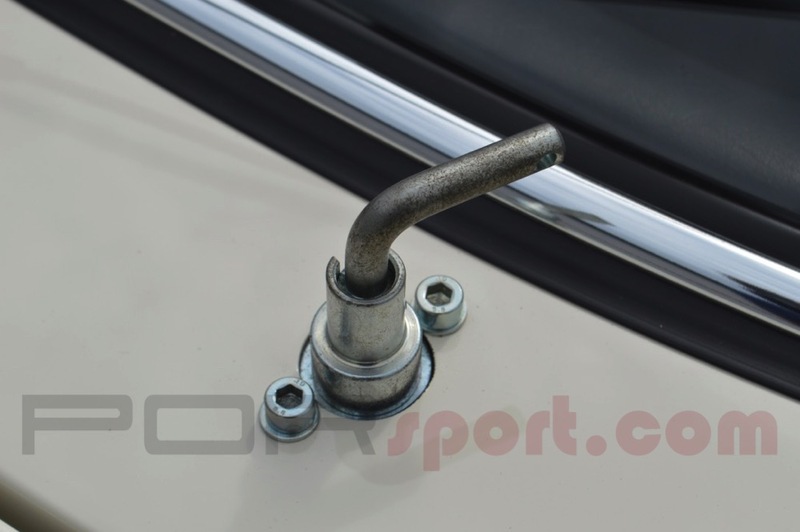 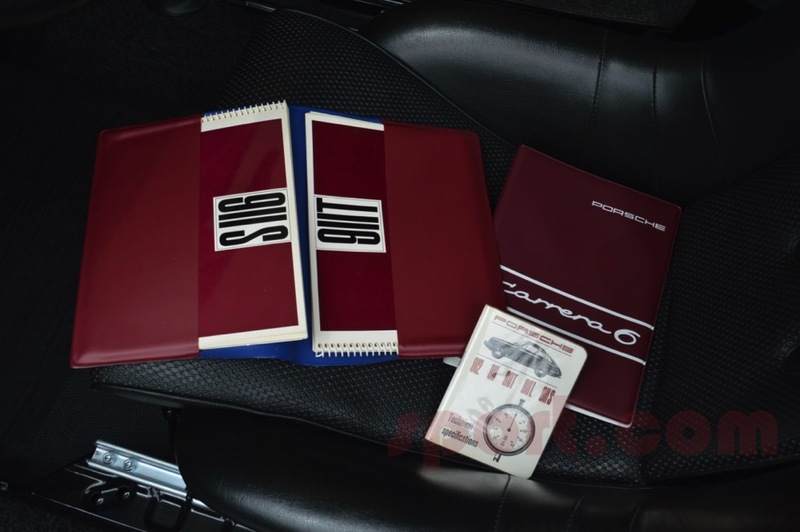 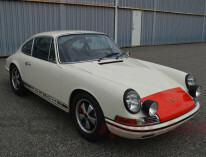 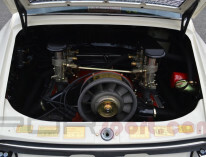 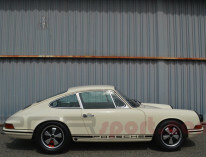 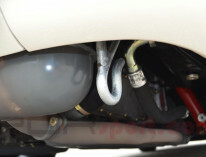 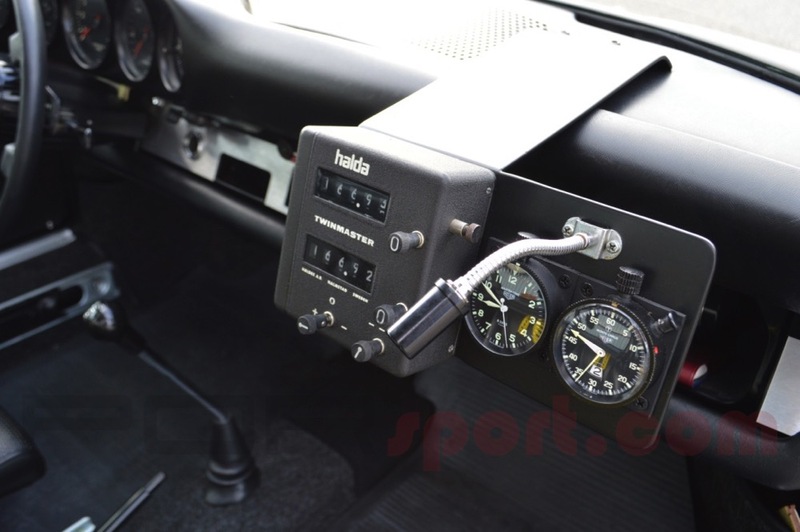 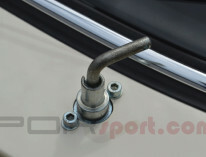 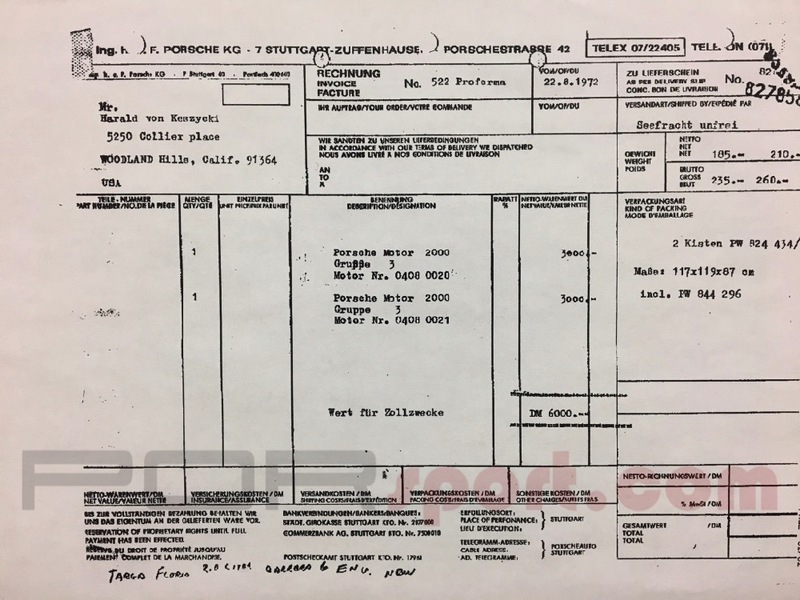 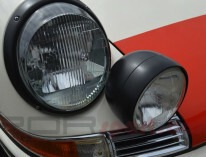 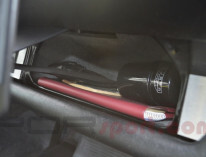 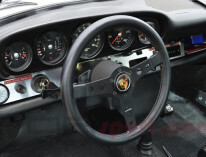 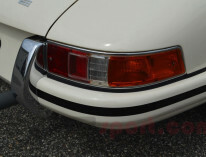 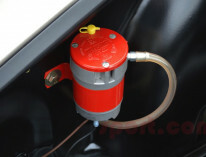 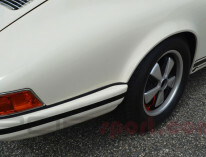 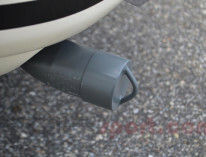 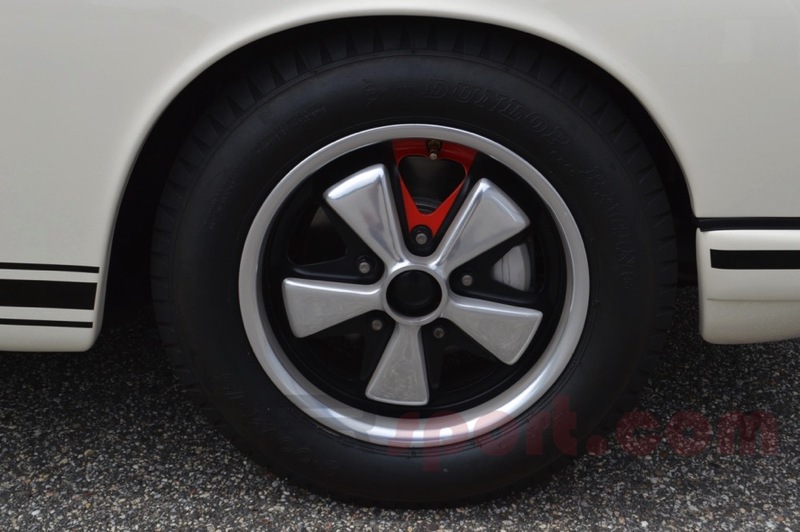 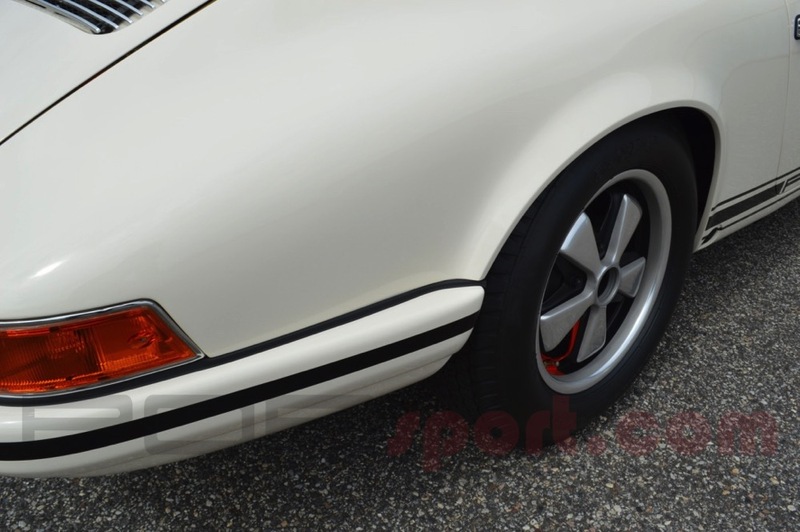 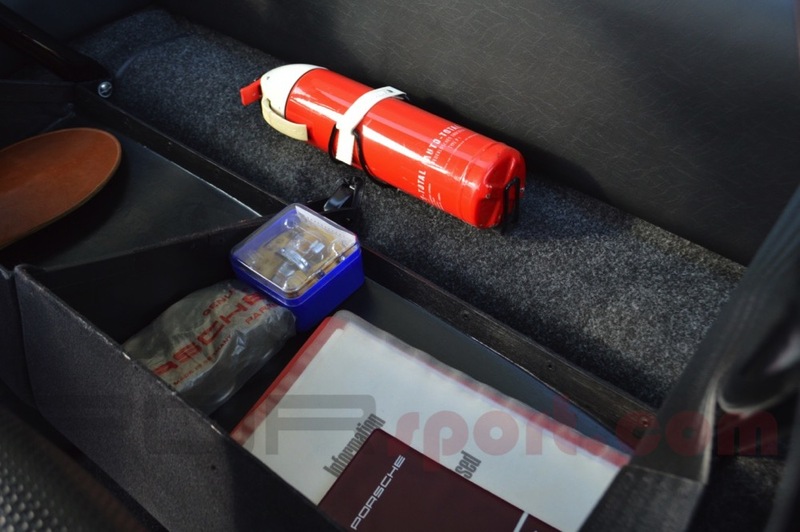 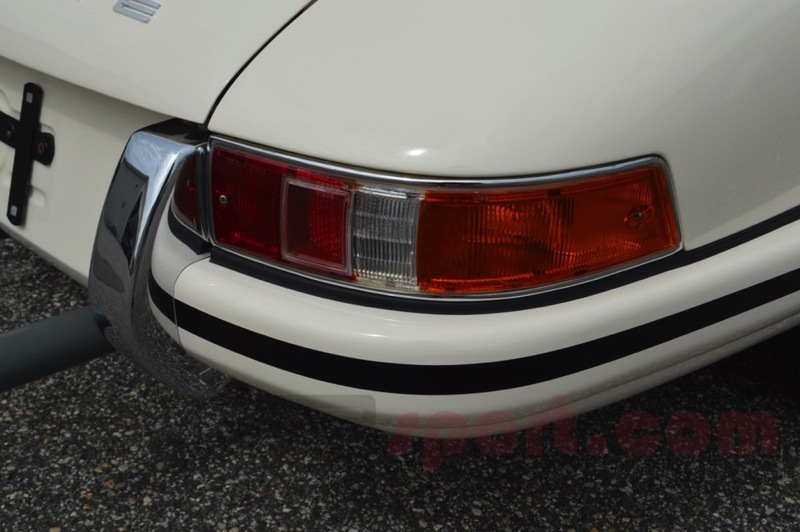 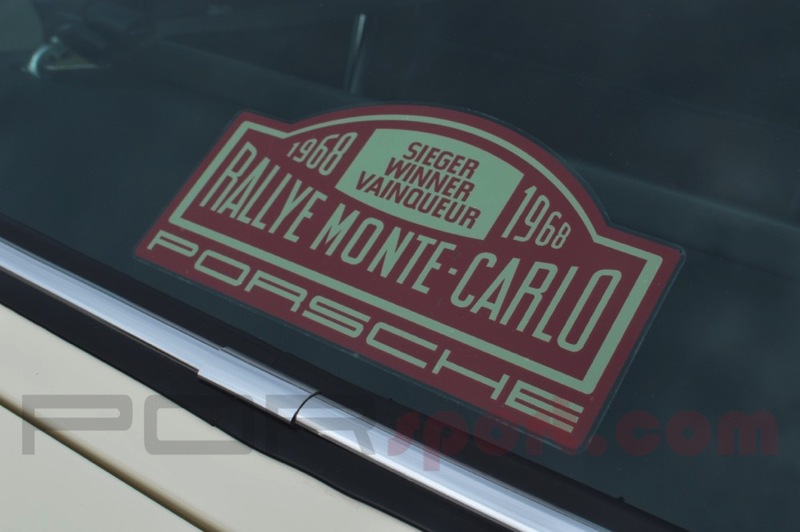 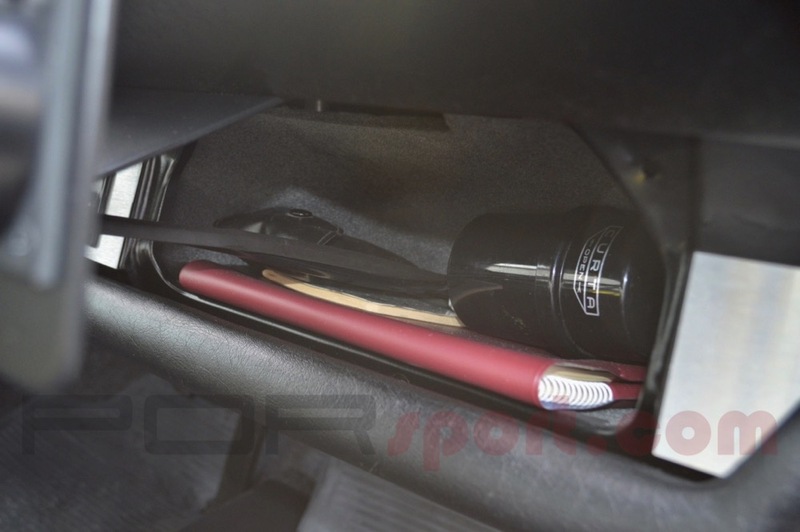 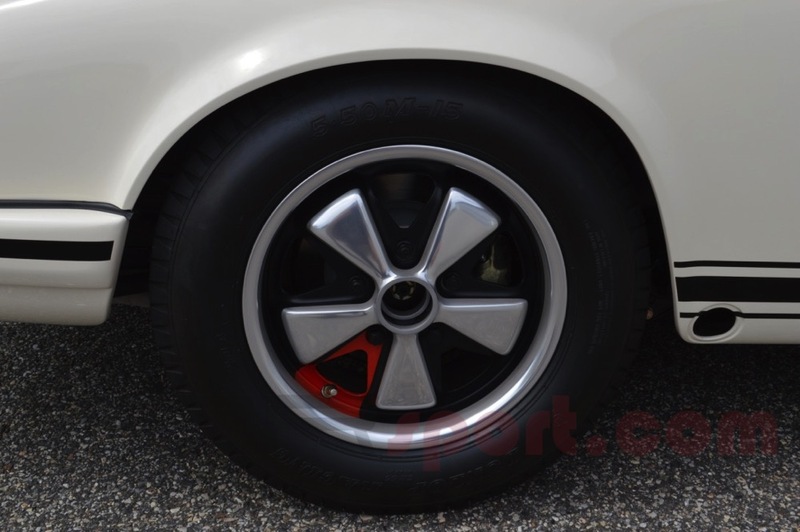 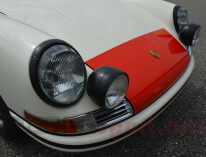 Porsche offered a Group 3 Rally Kit option and many were built up from Sports Purpose parts that were made available at the dealer. 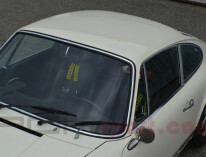 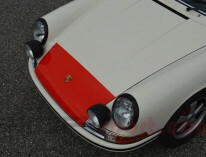 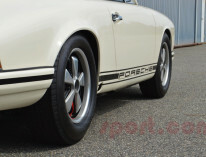 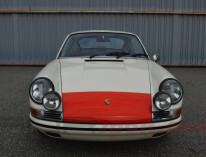 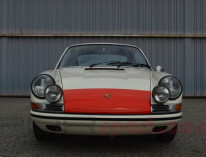 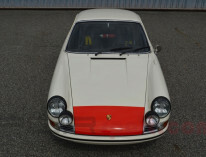 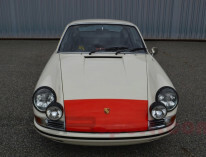 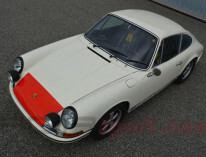 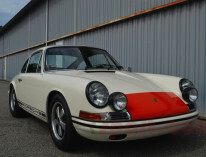 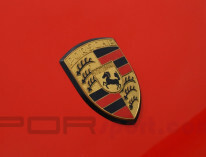 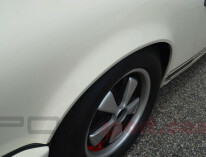 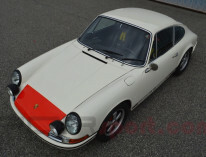 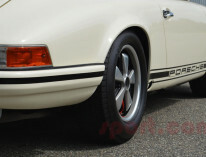 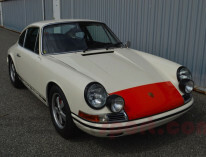 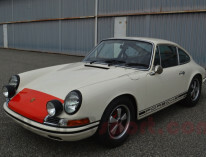 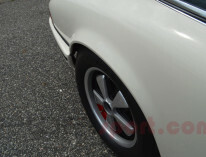 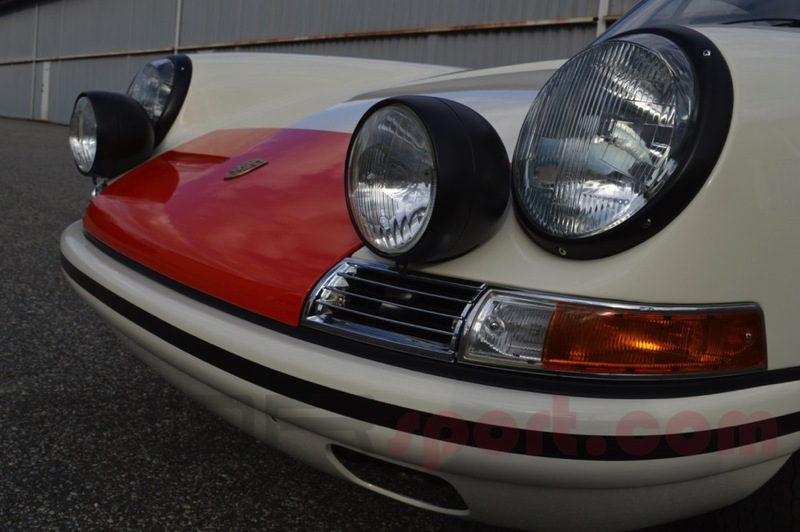 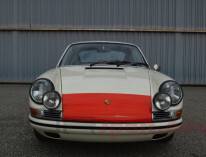 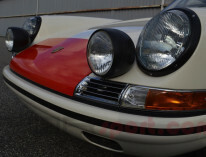 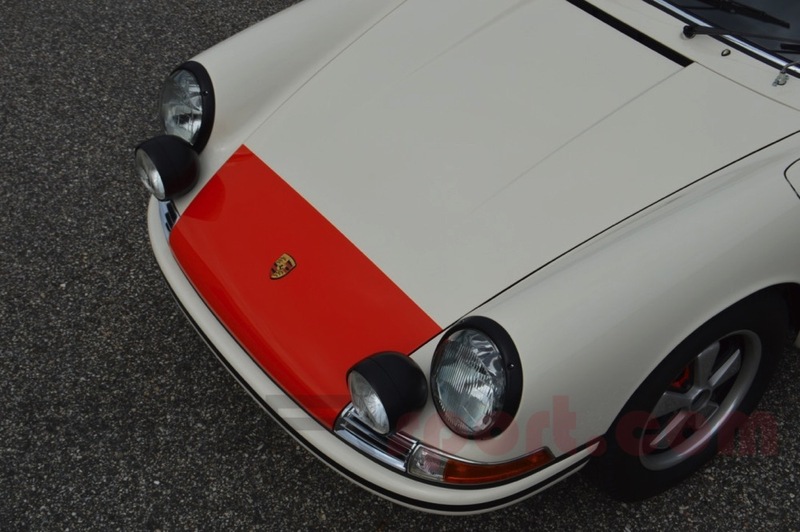 These cars are unofficially known as the 911 T/R. 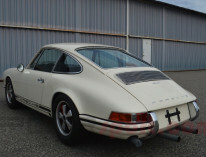 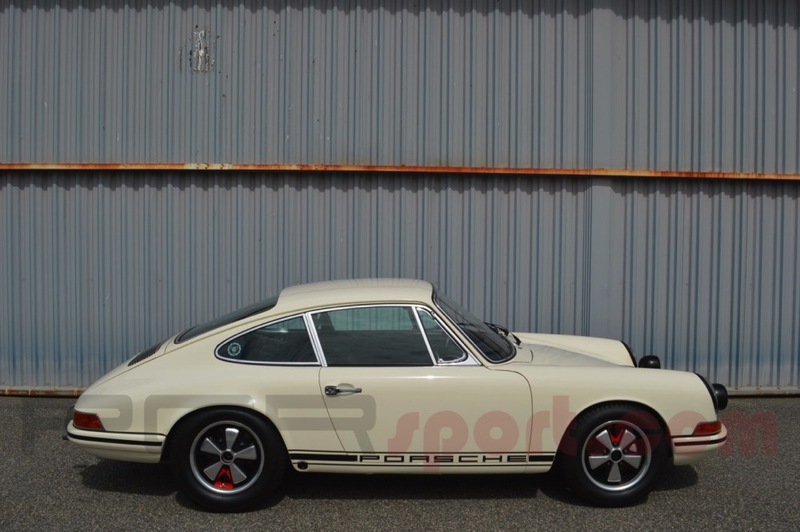 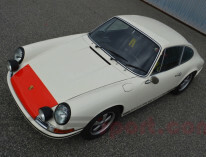 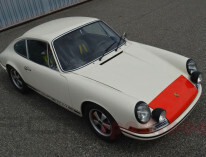 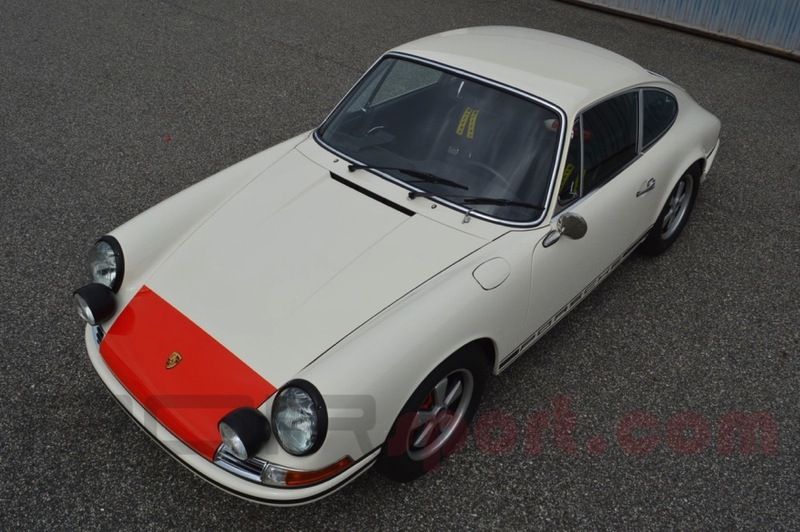 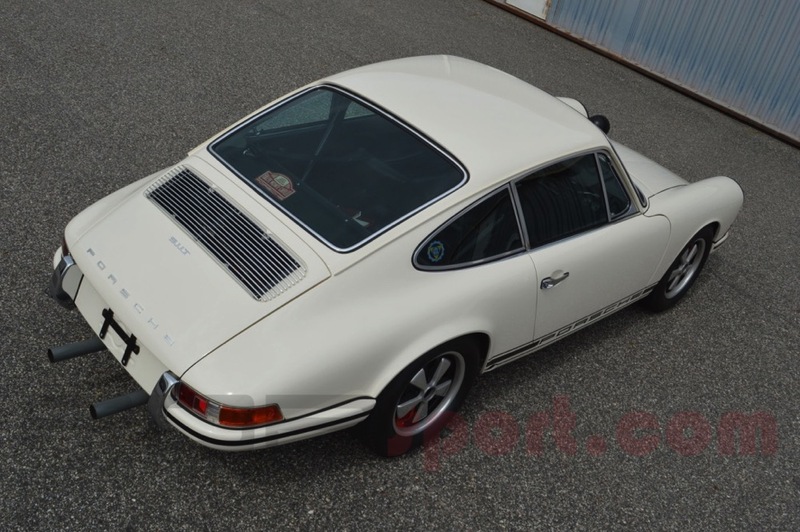 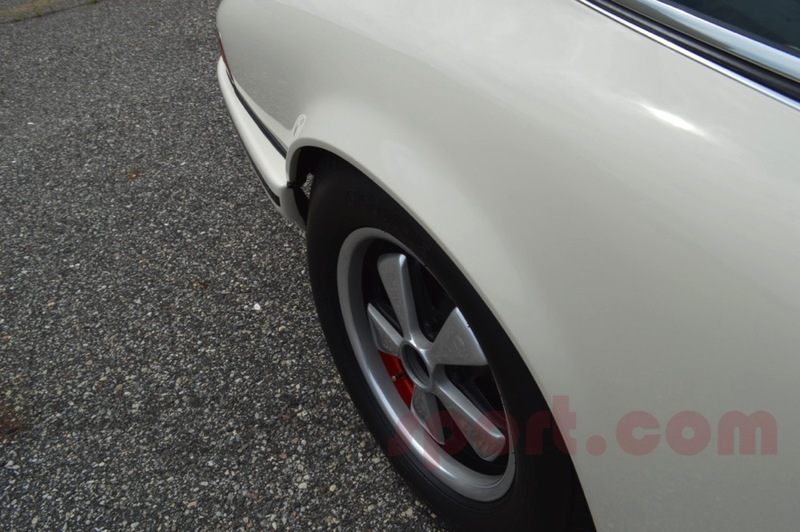 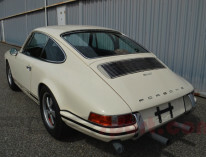 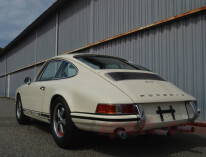 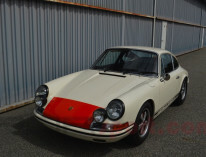 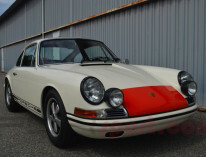 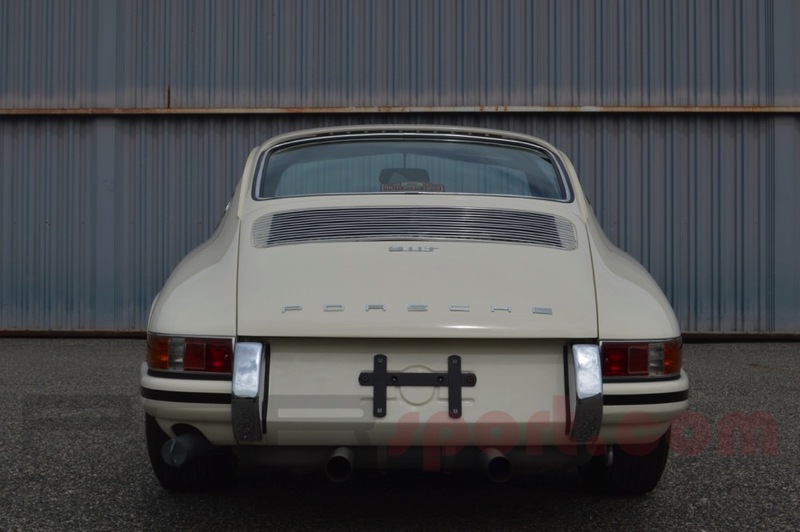 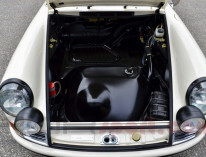 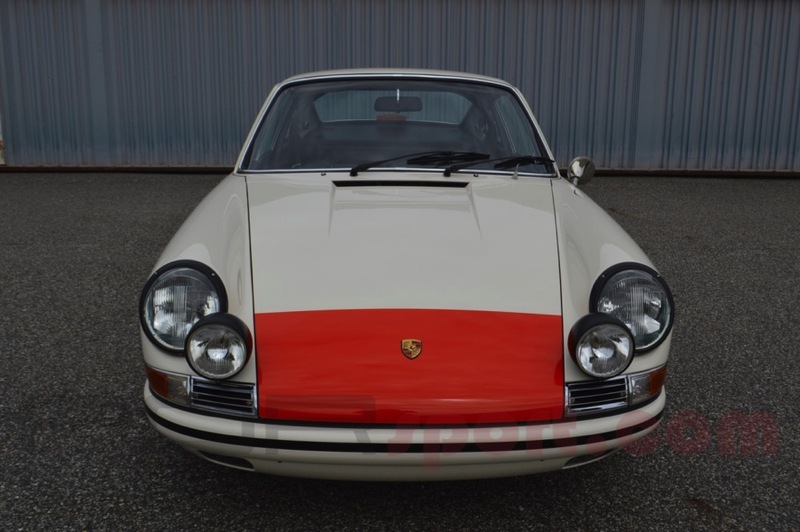 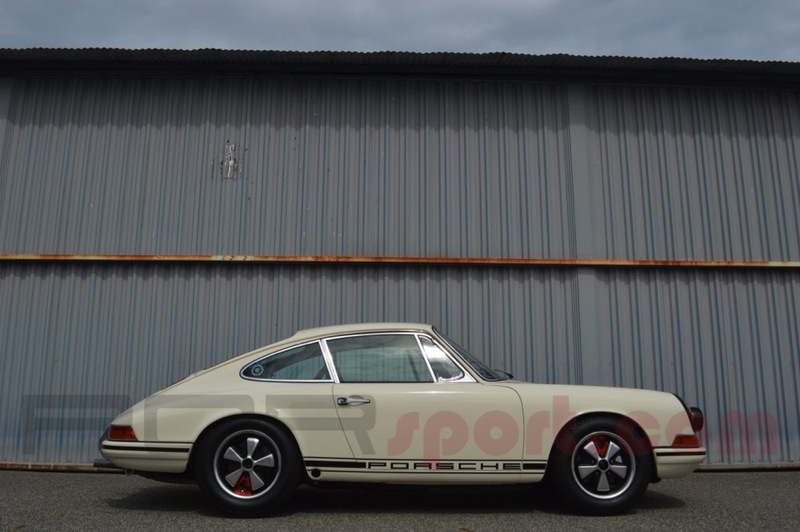 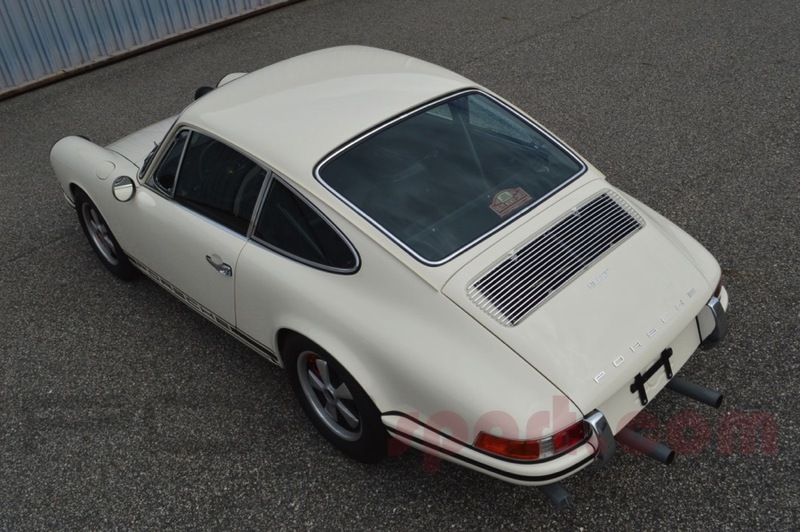 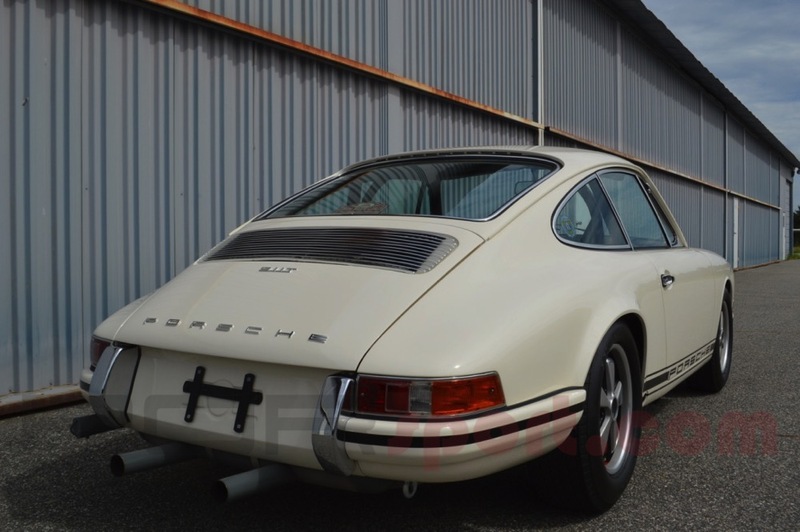 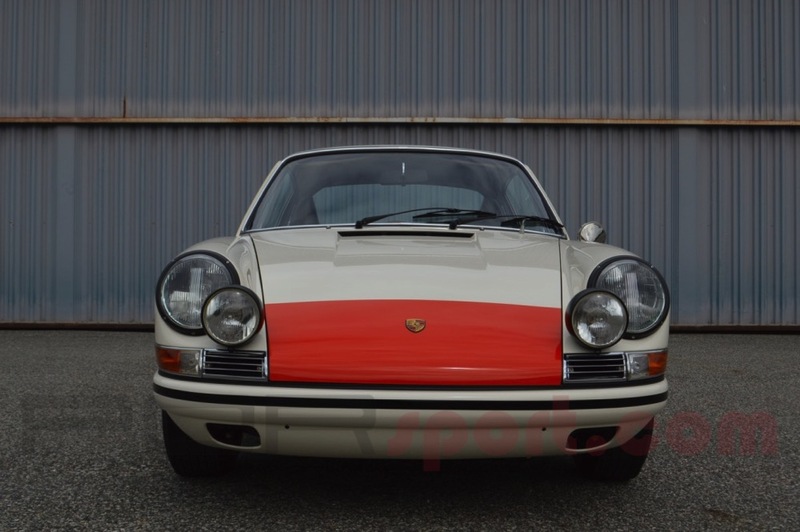 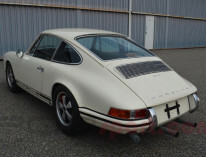 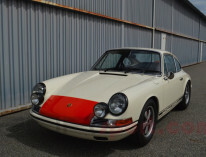 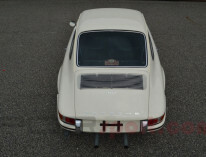 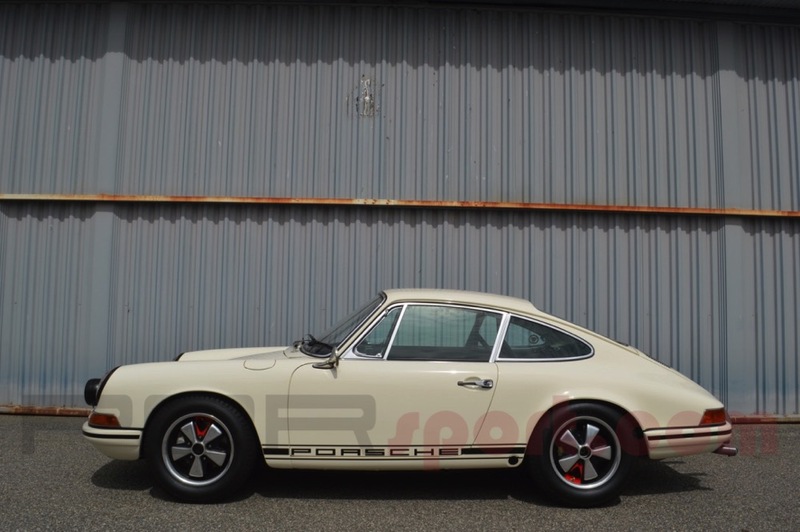 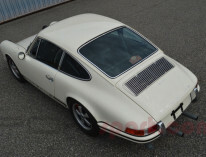 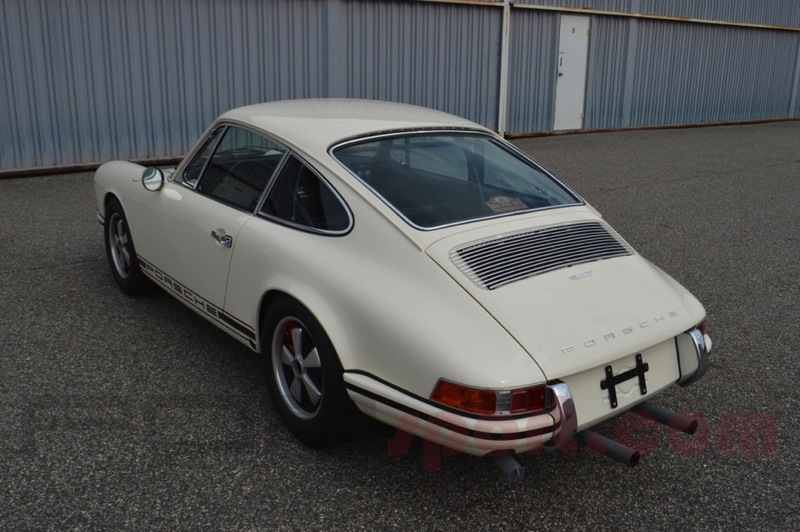 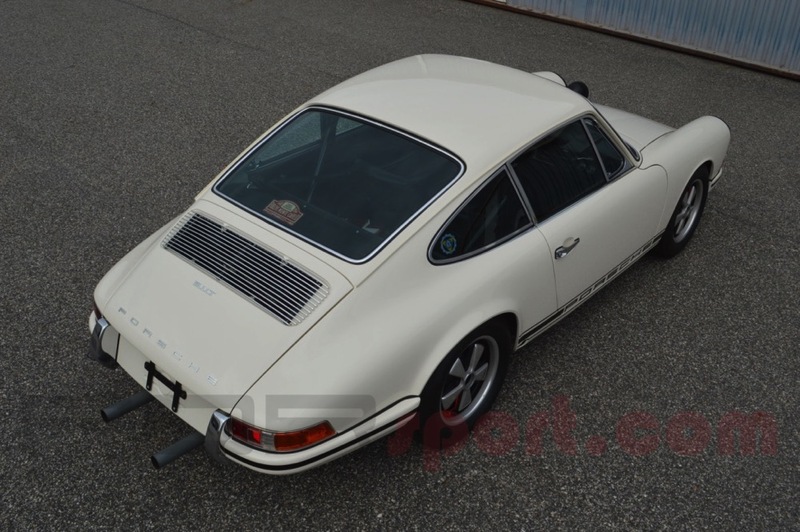 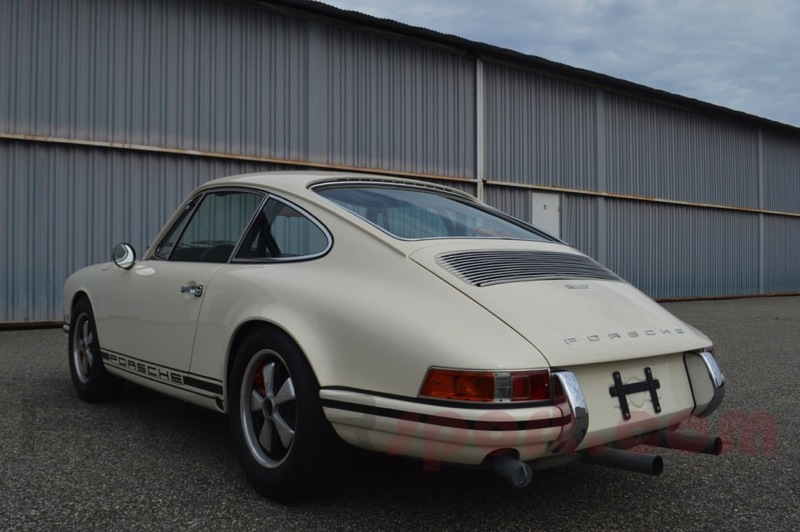 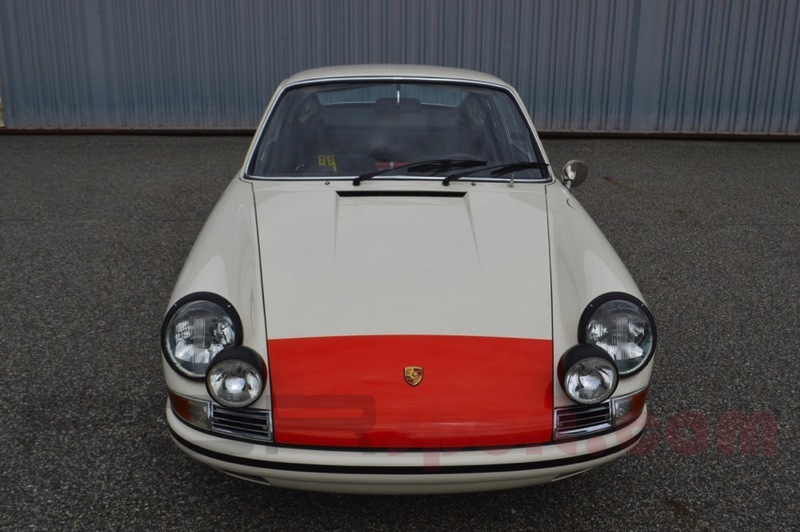 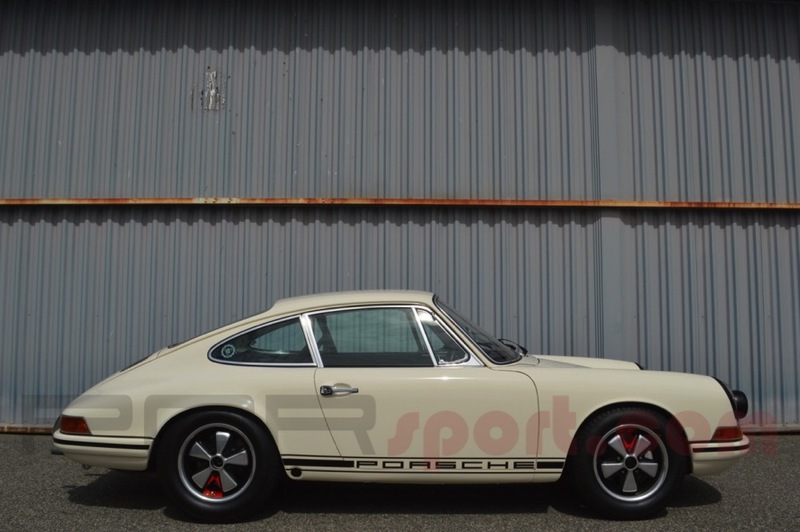 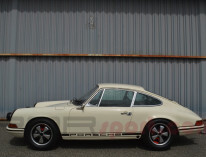 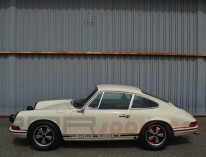 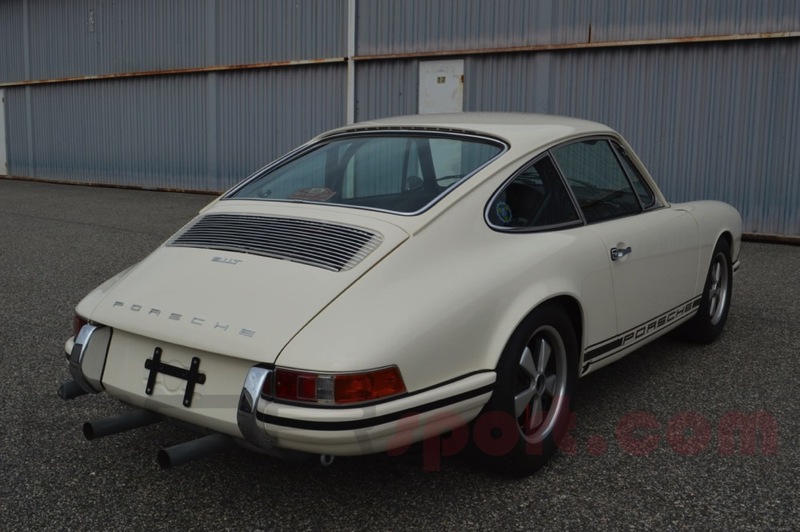 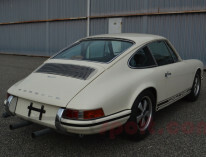 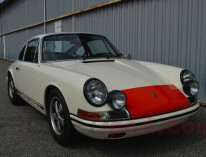 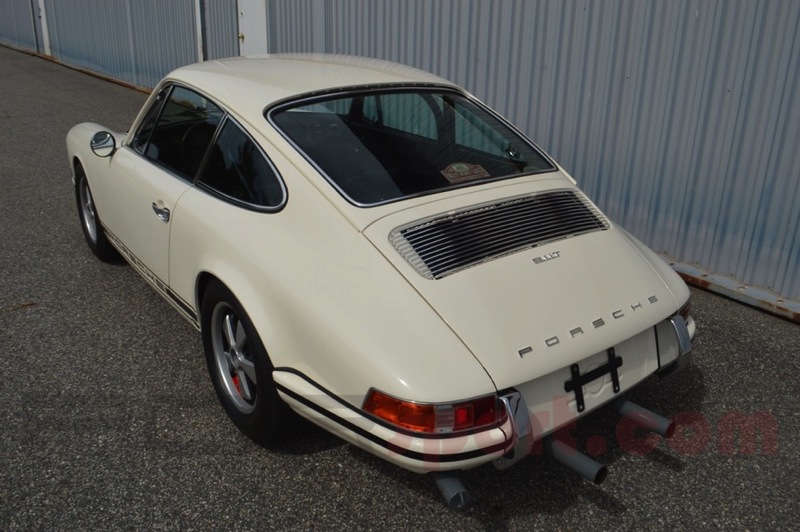 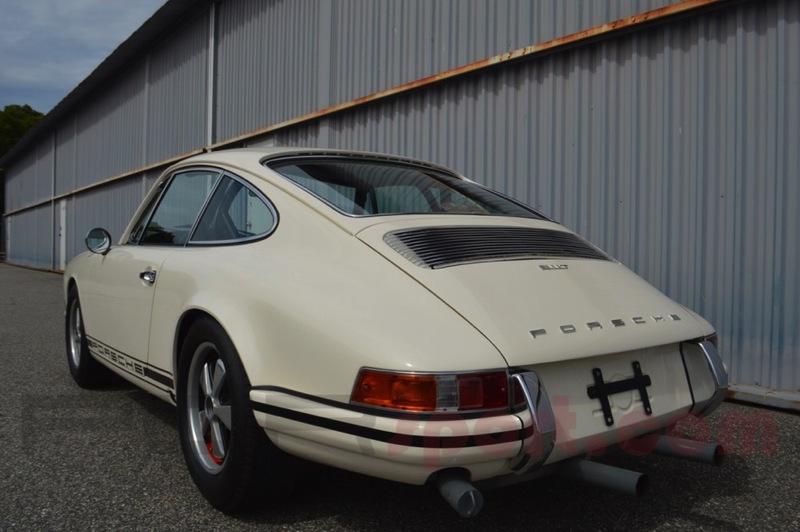 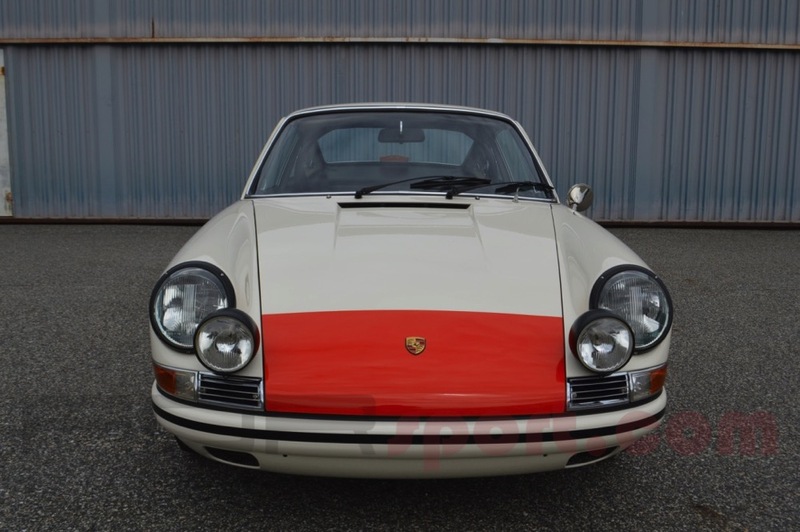 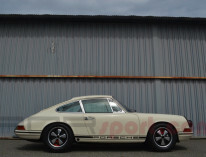 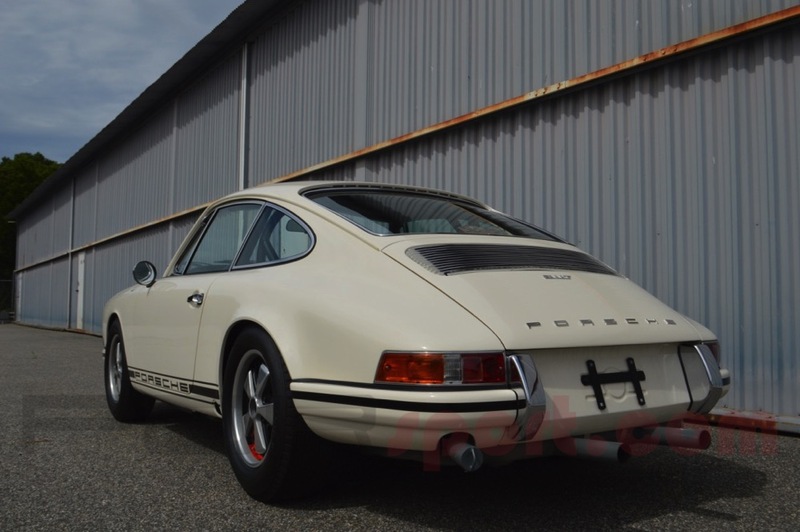 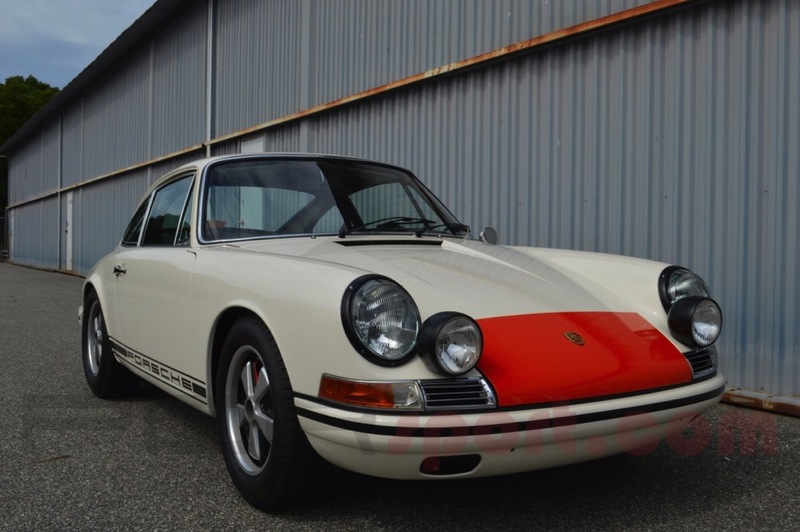 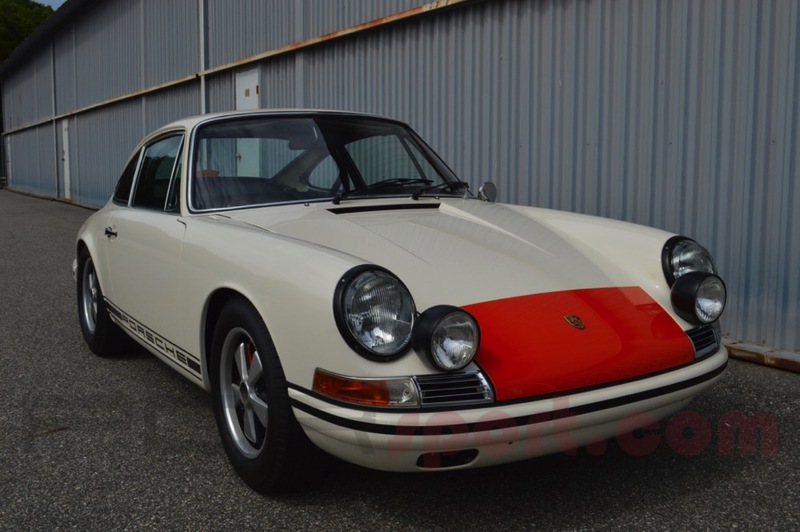 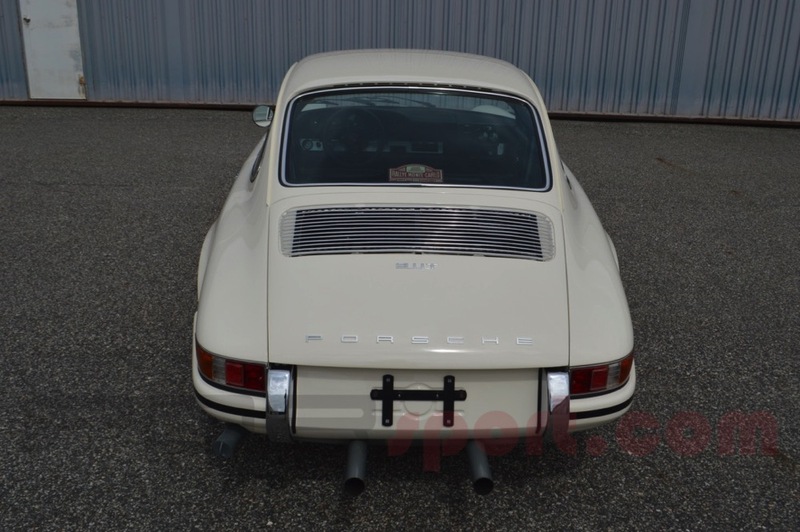 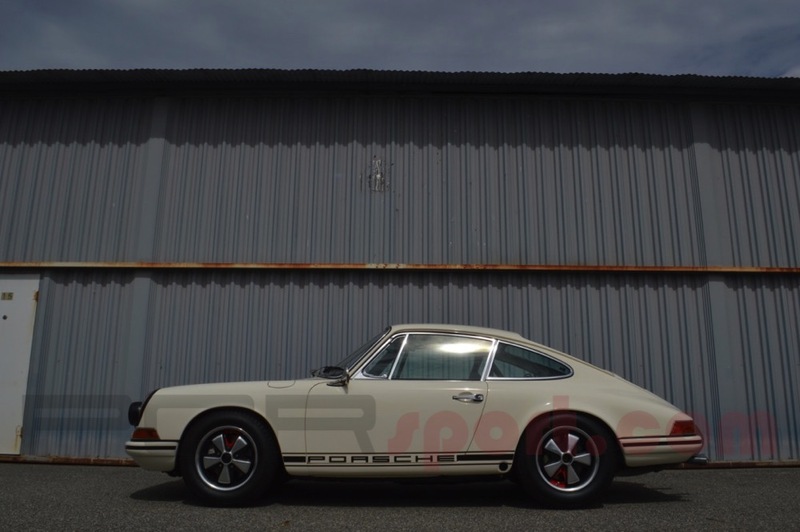 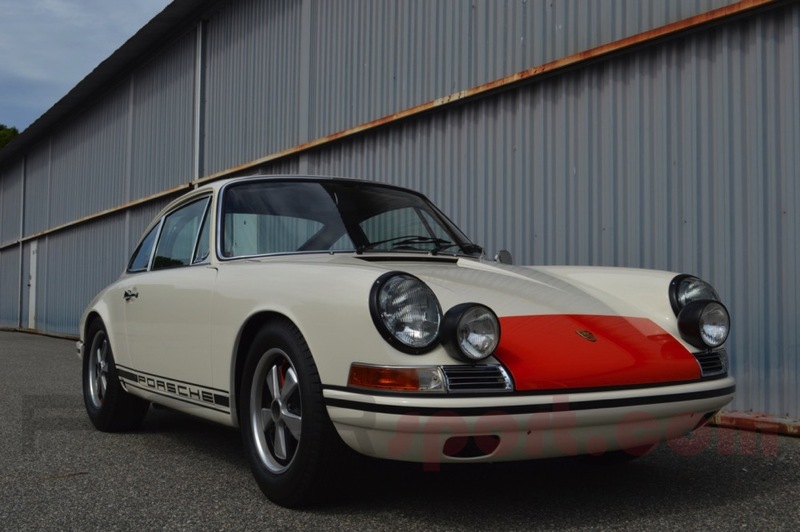 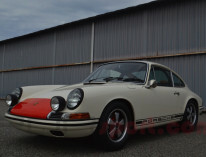 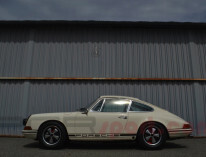 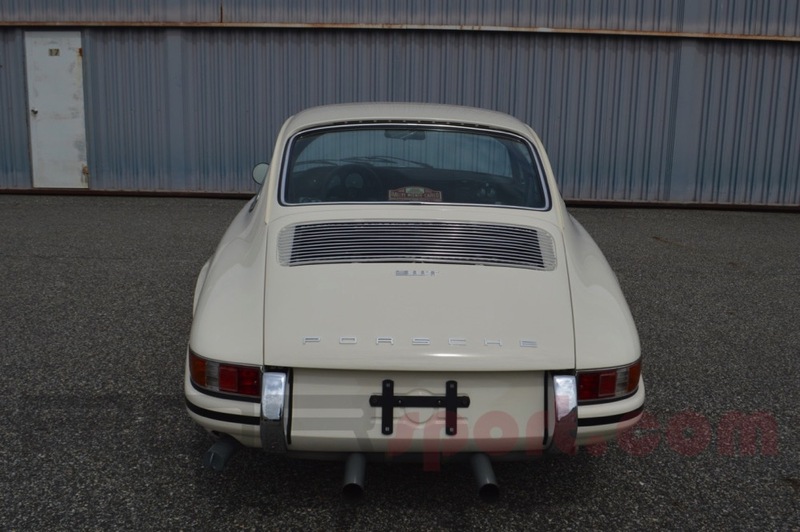 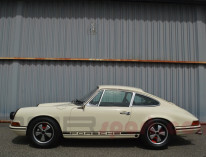 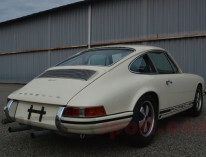 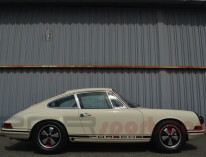 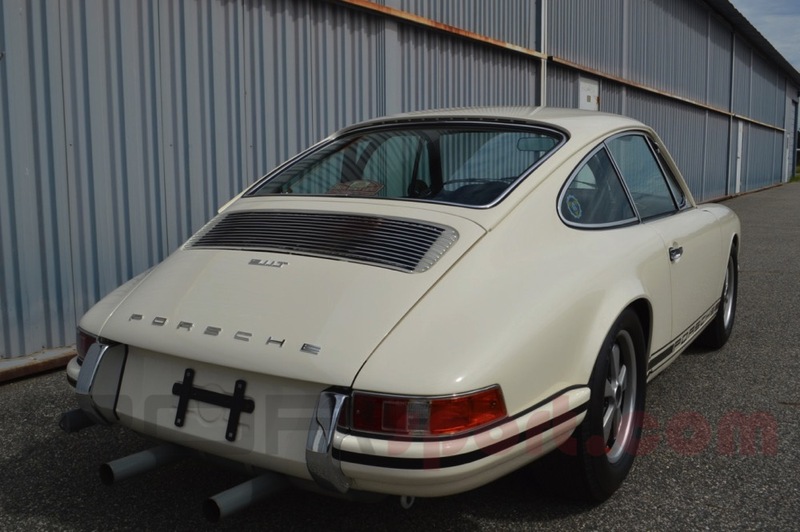 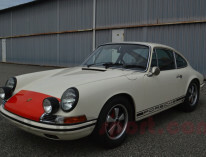 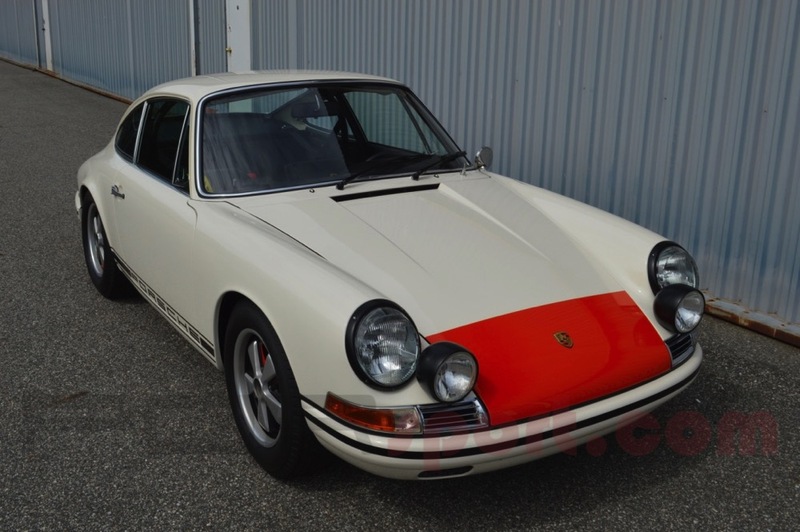 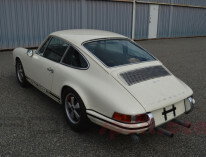 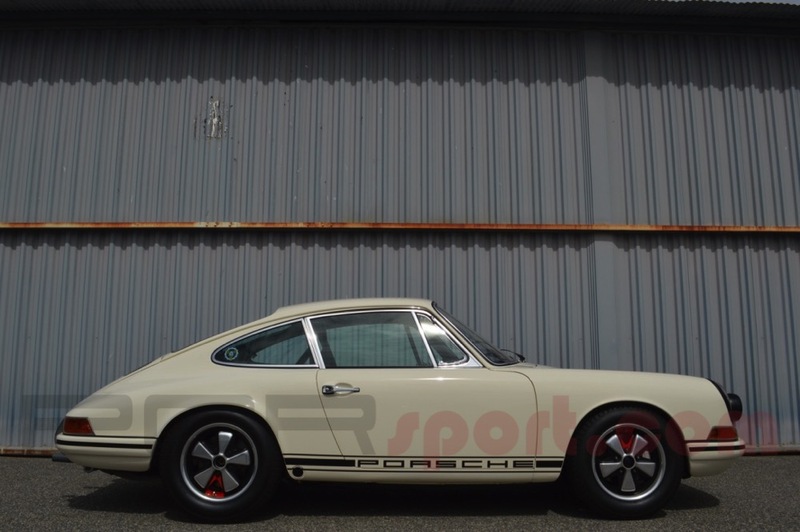 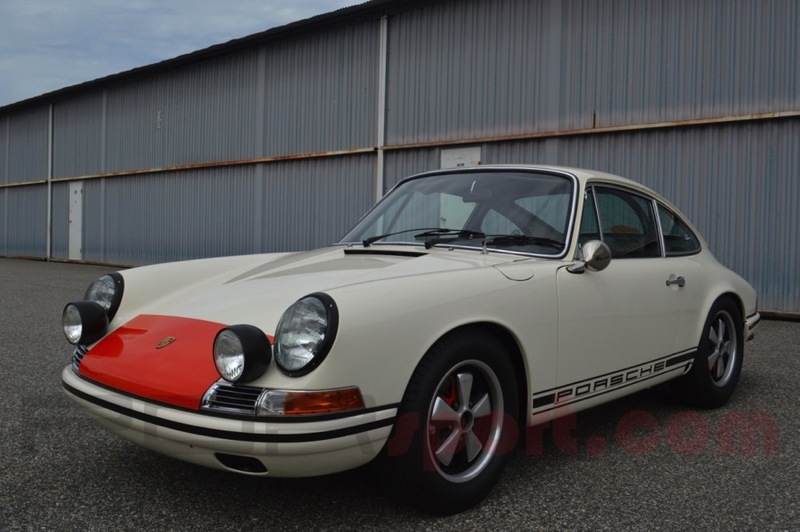 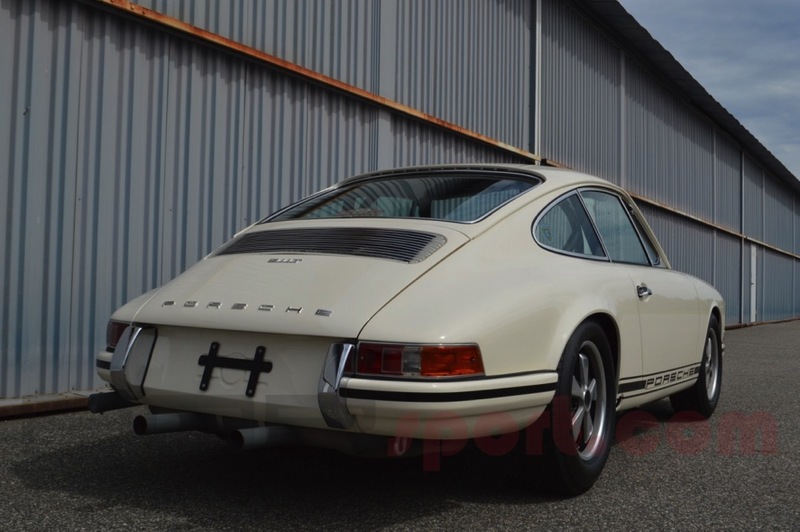 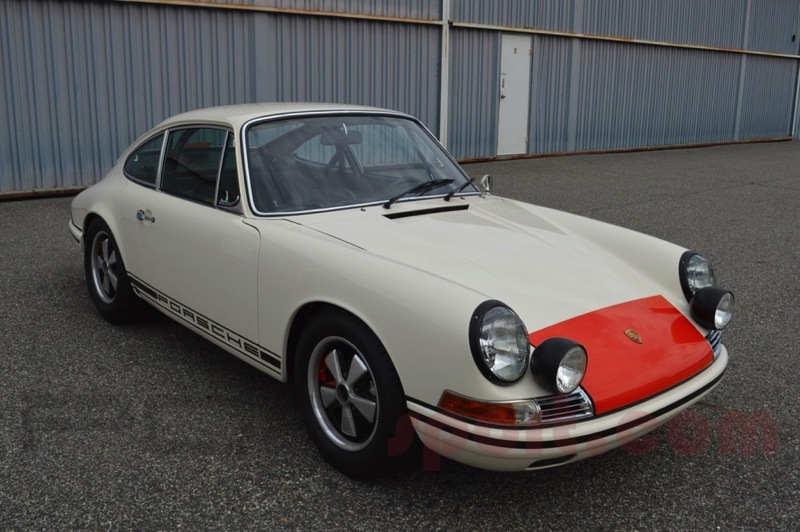 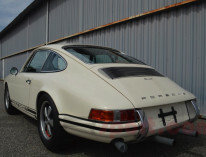 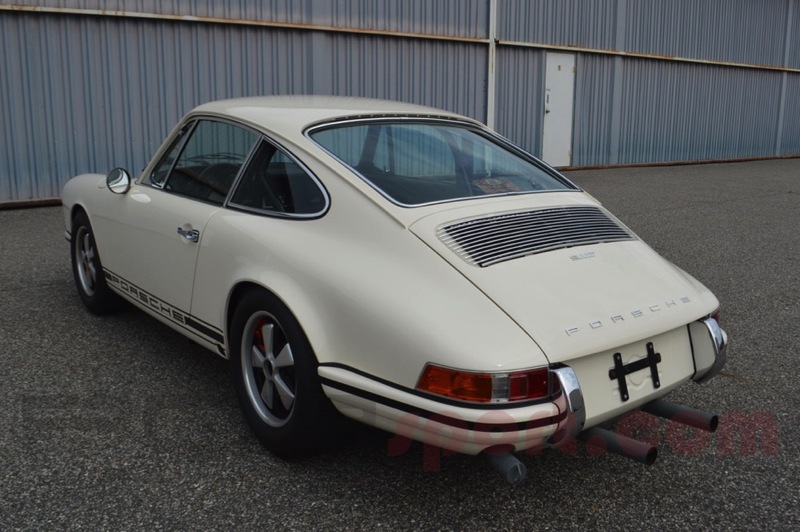 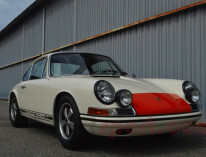 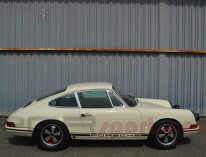 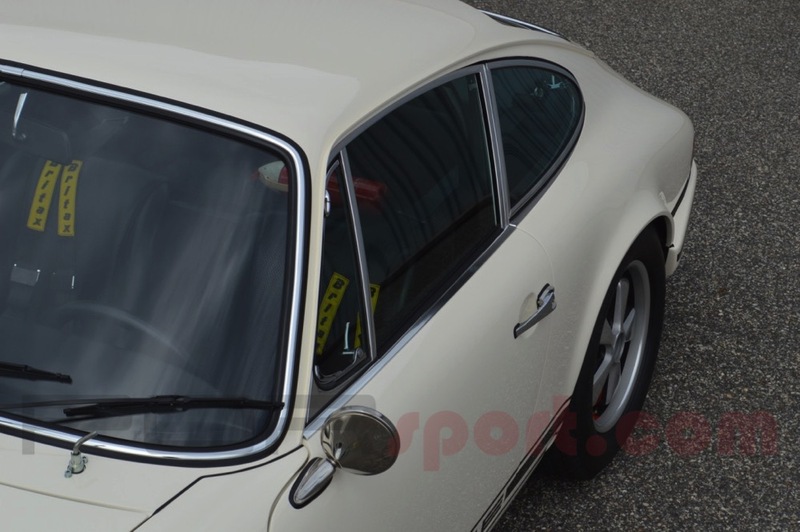 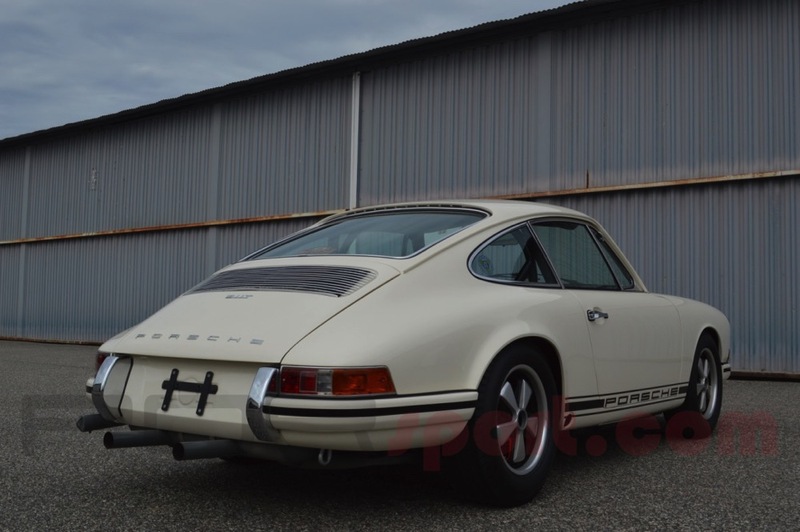 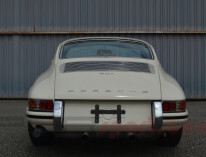 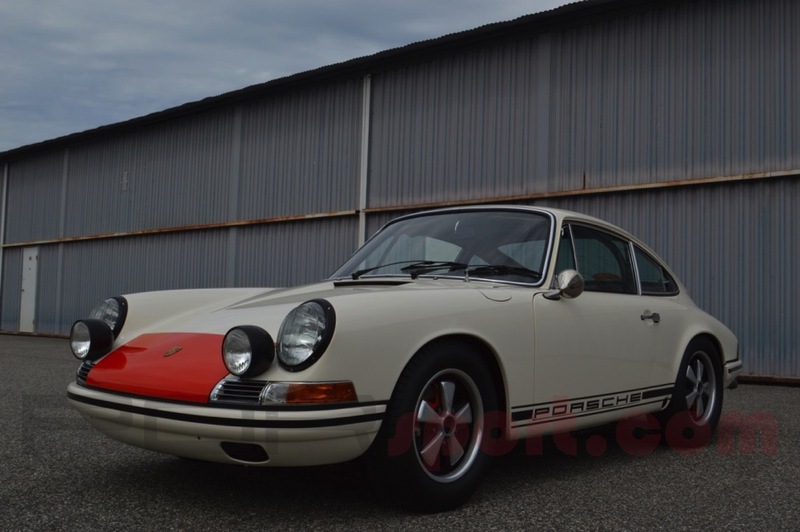 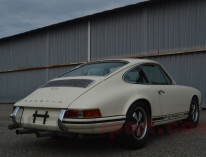 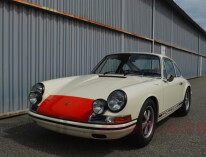 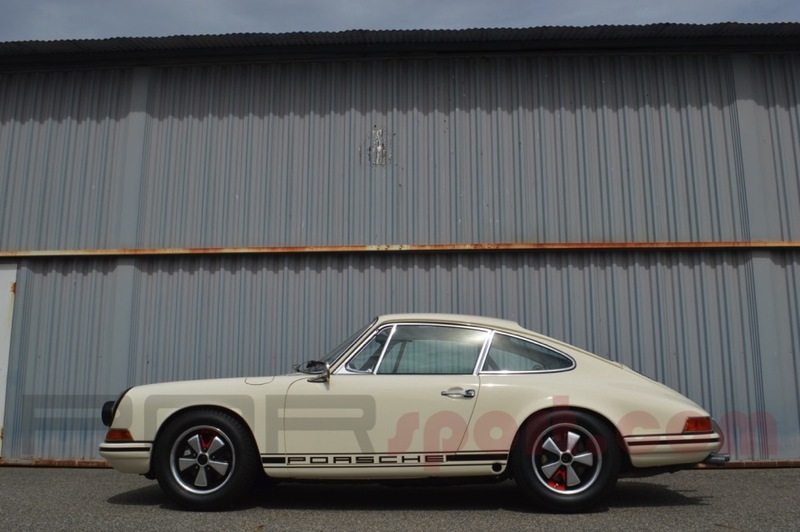 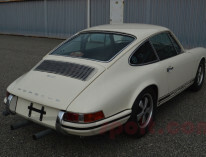 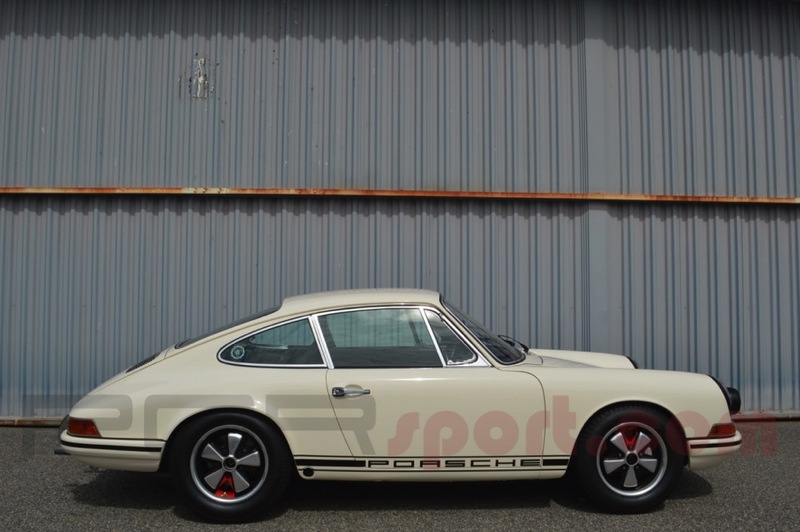 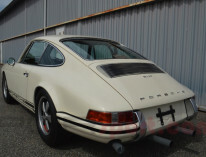 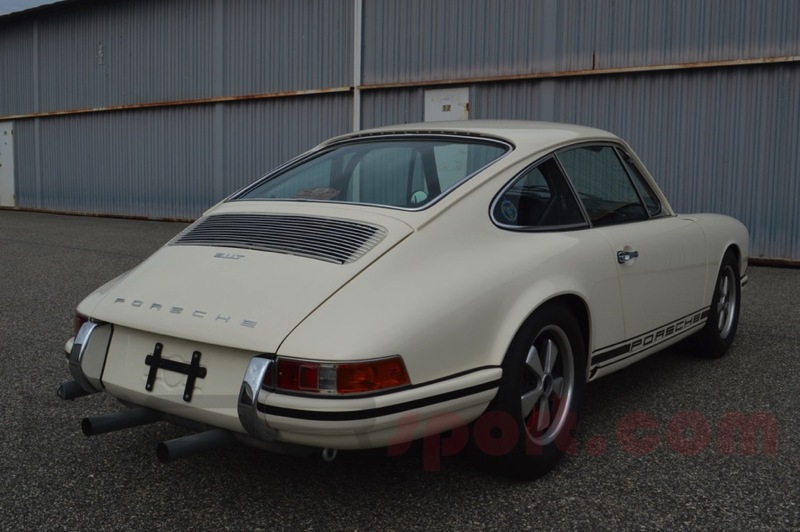 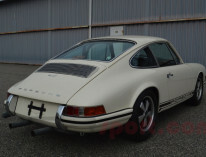 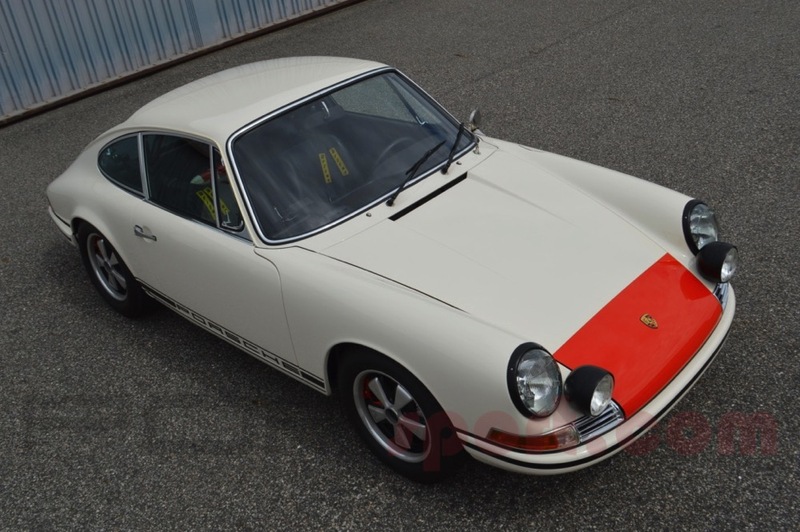 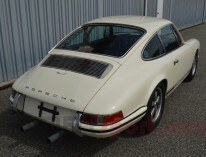 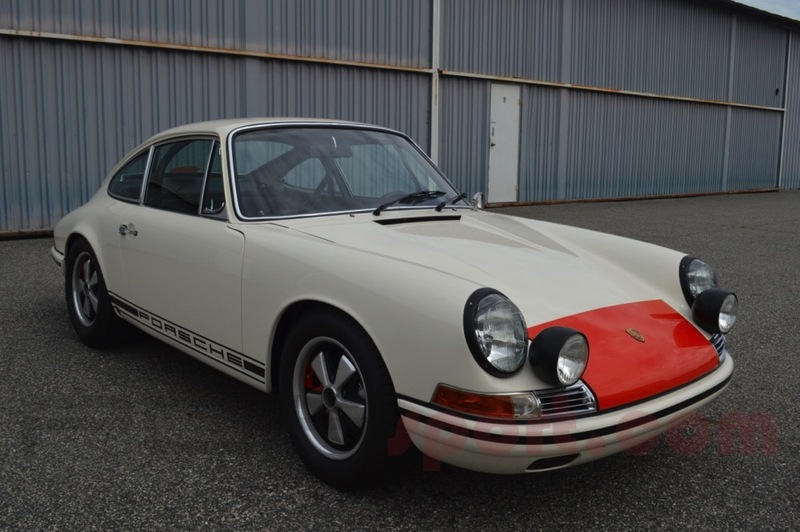 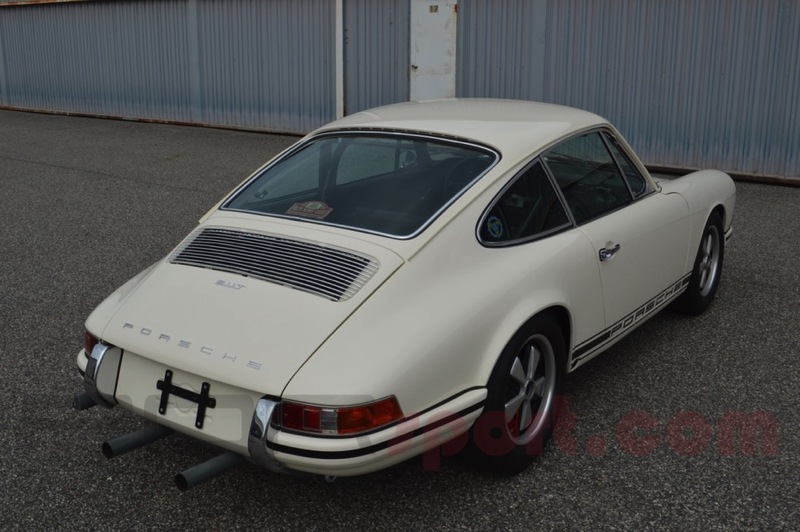 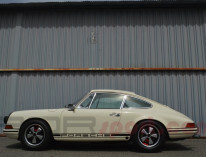 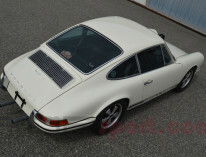 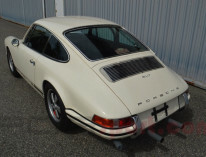 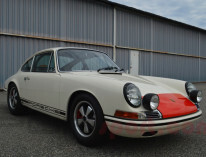 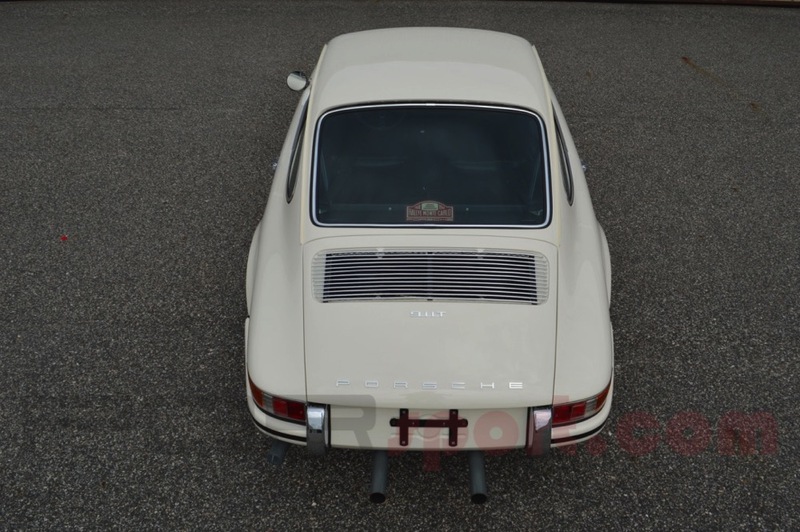 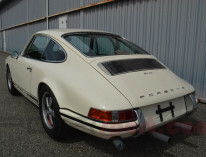 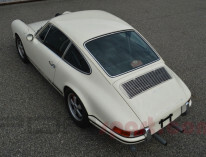 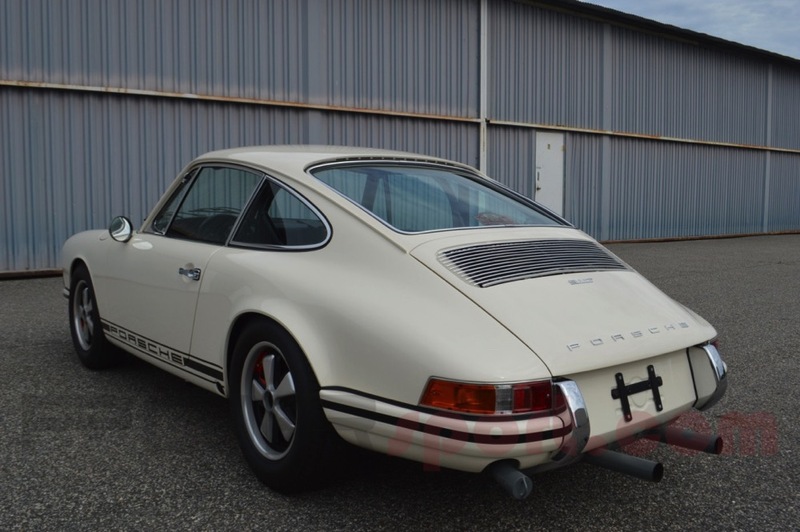 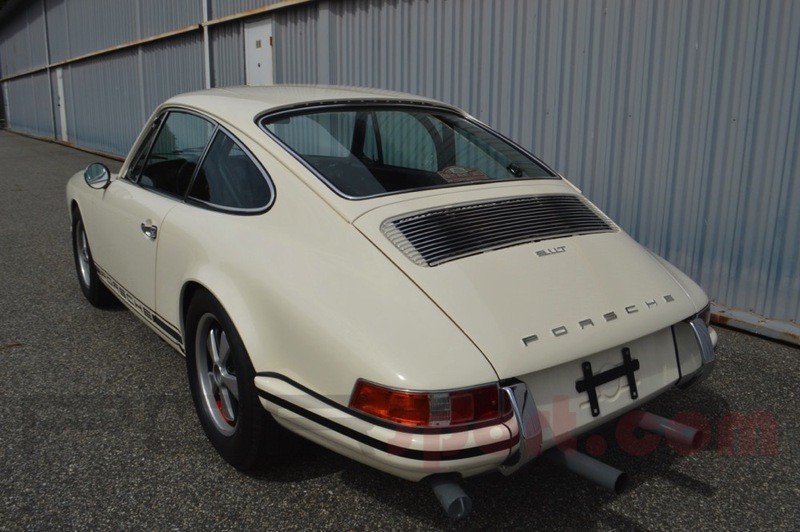 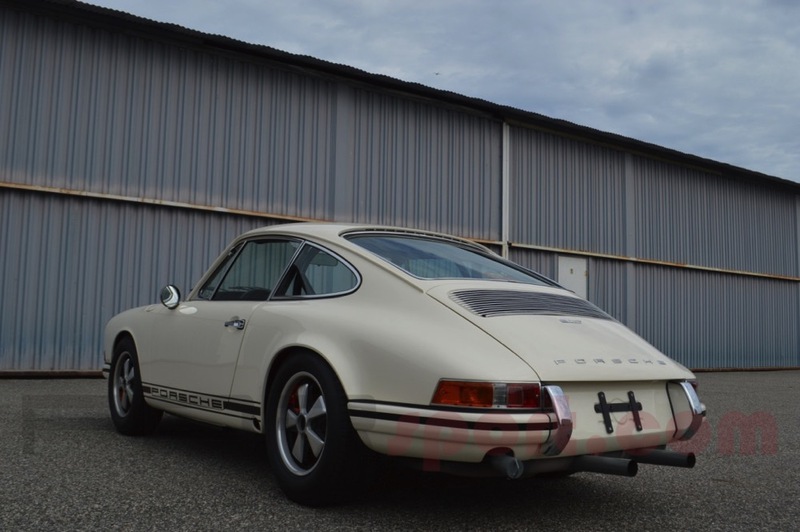 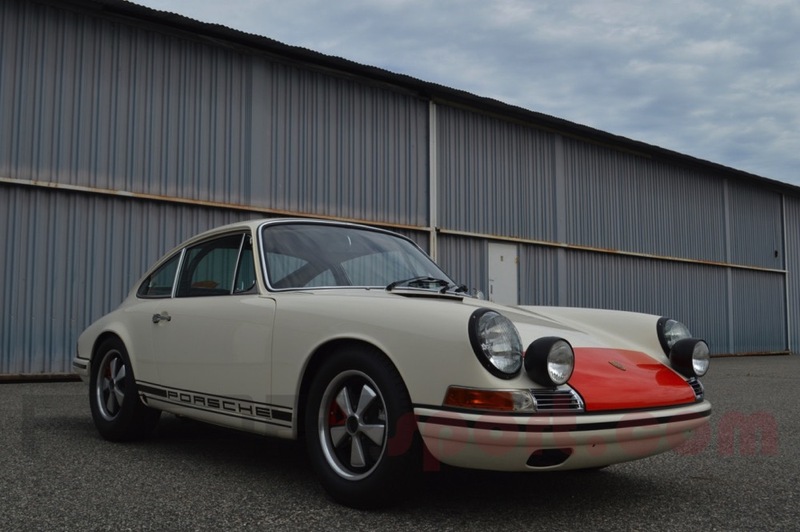 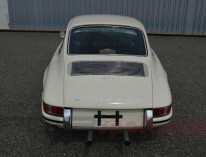 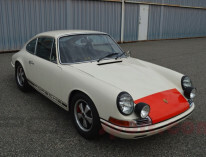 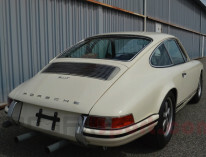 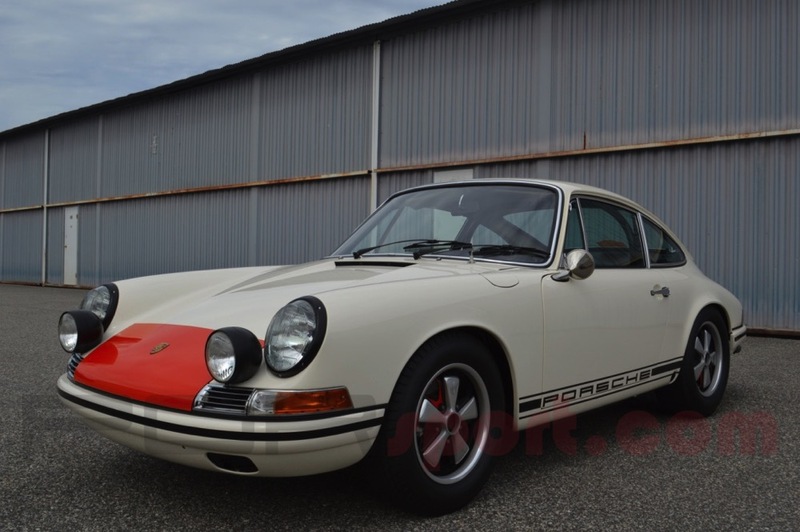 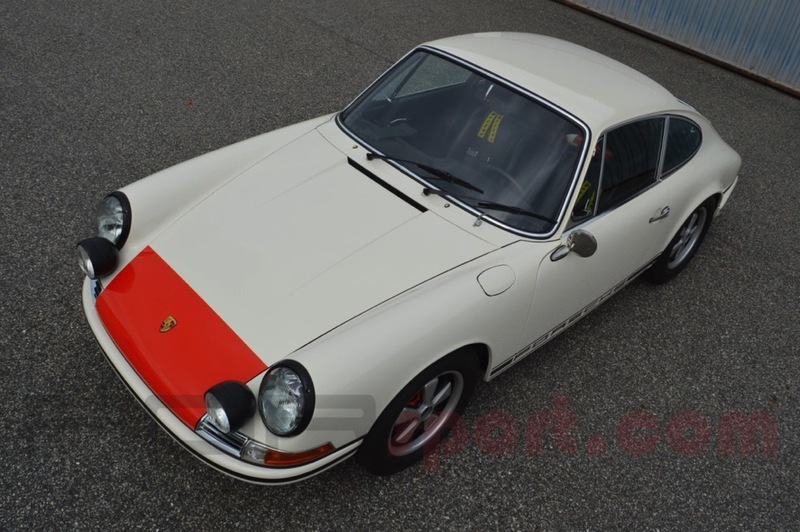 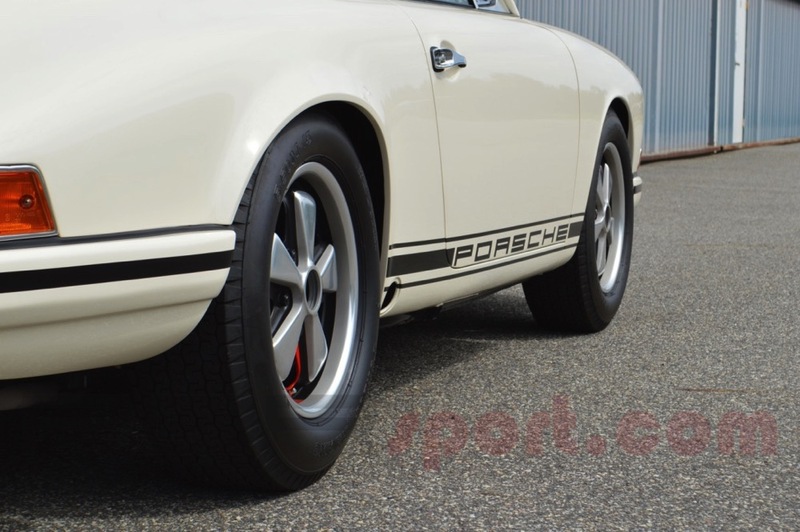 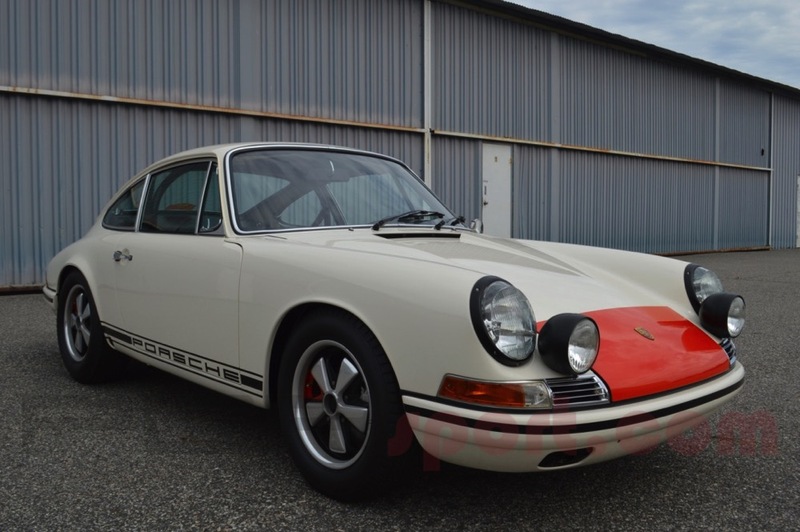 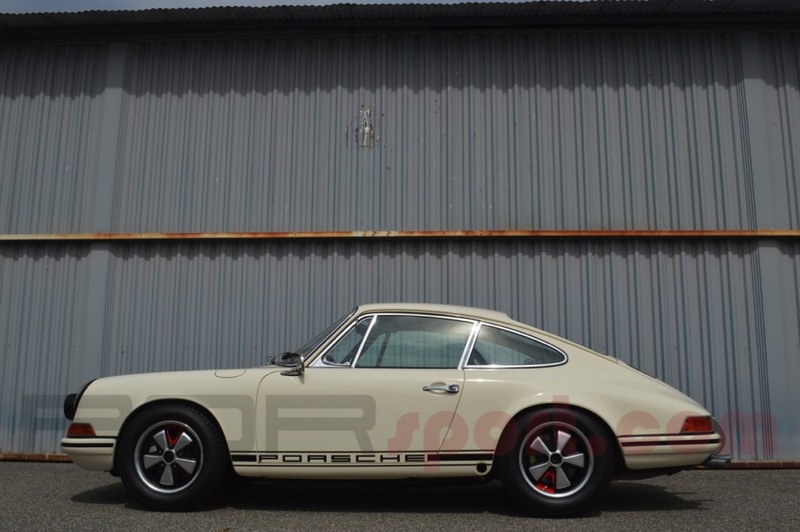 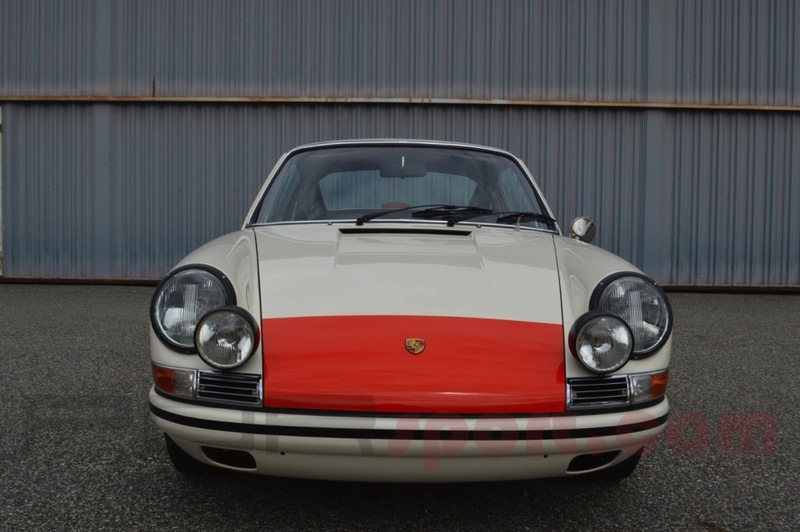 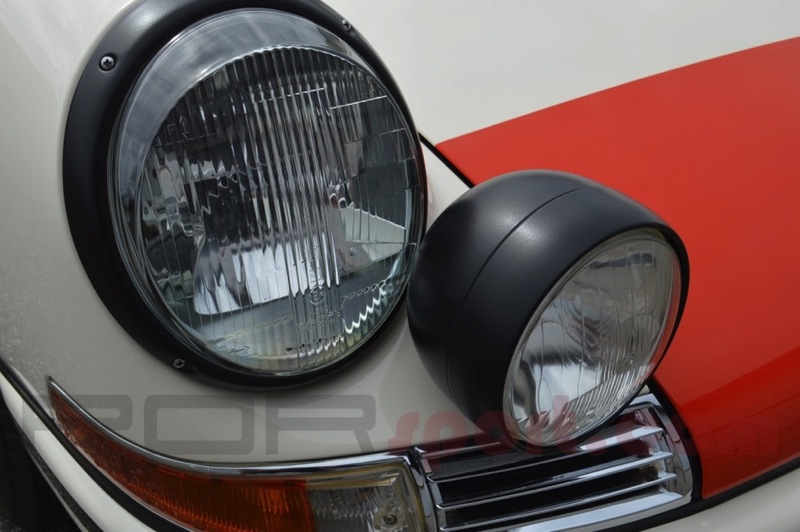 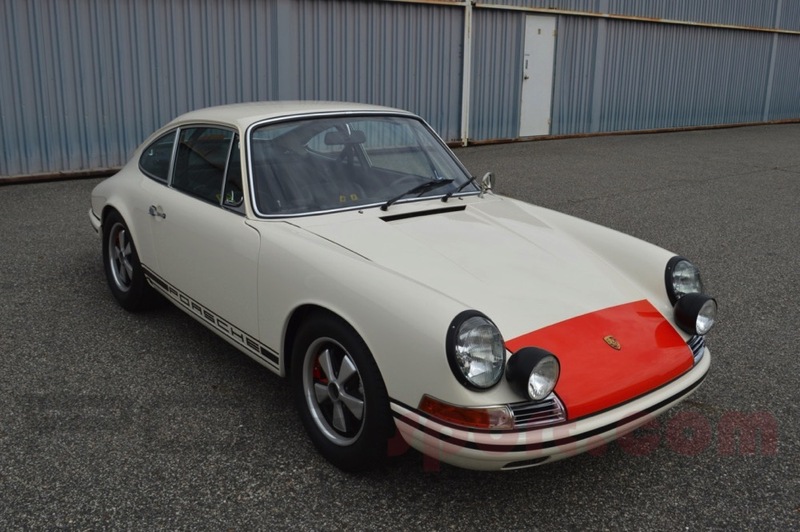 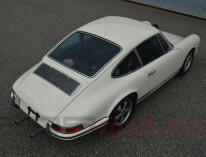 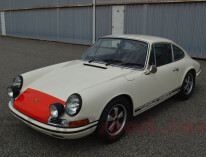 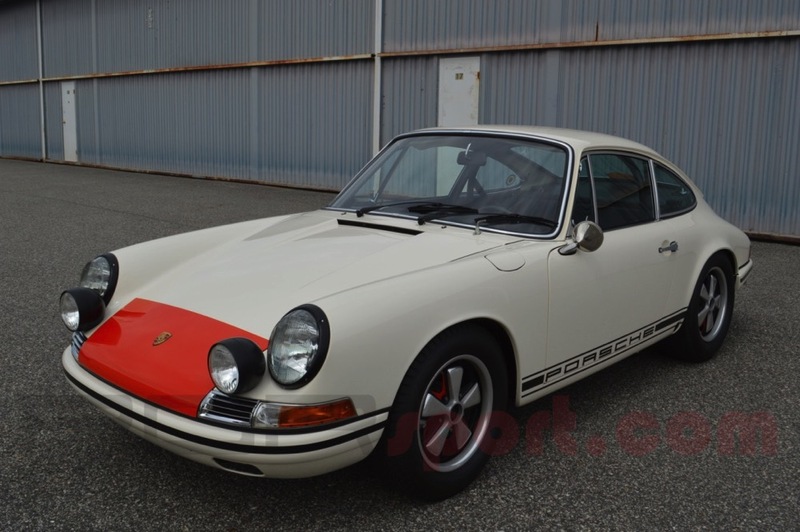 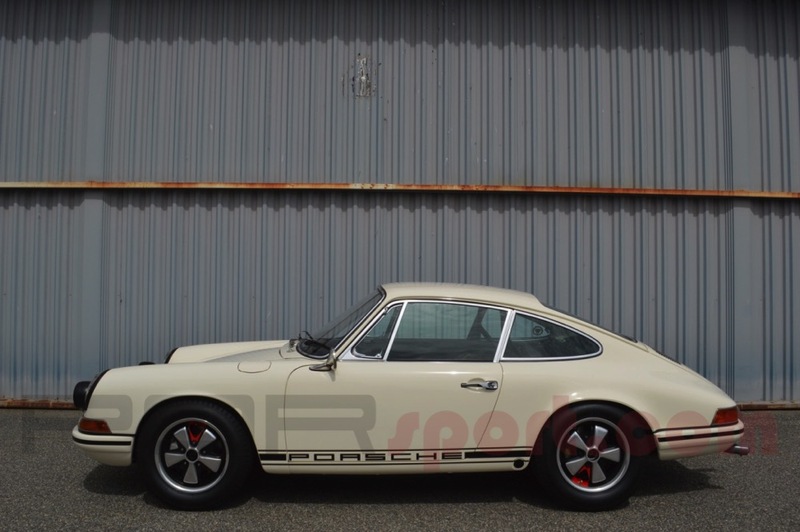 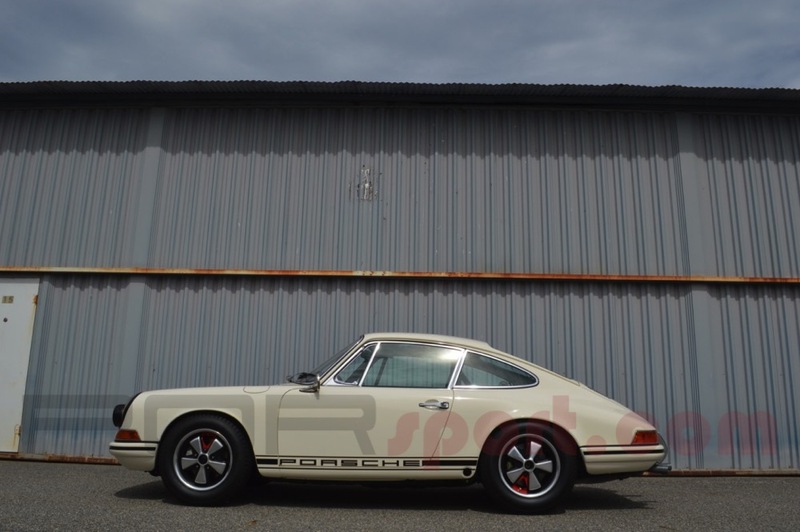 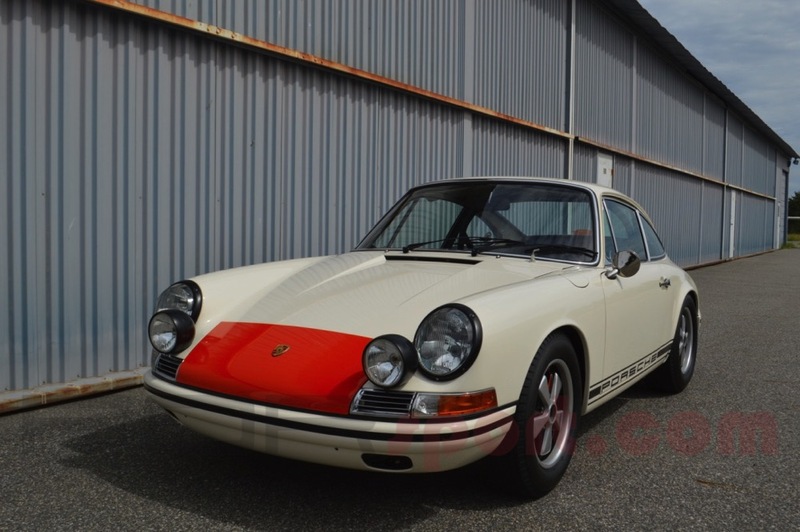 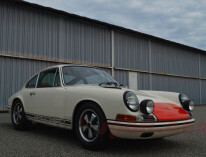 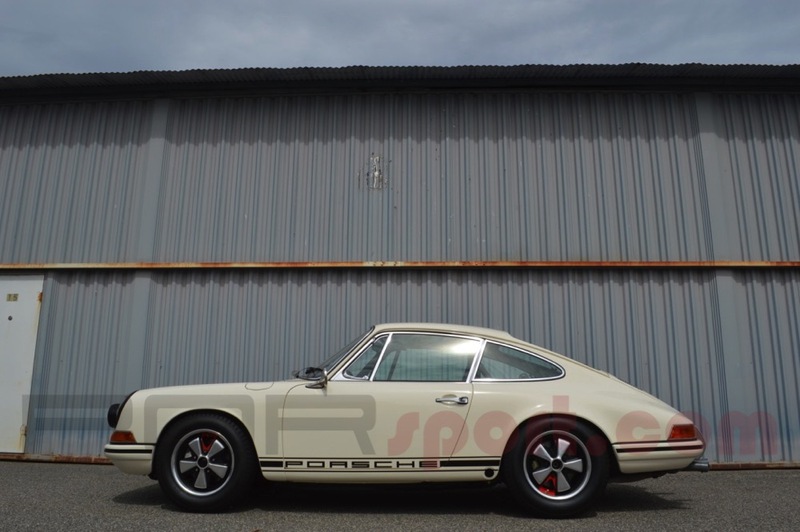 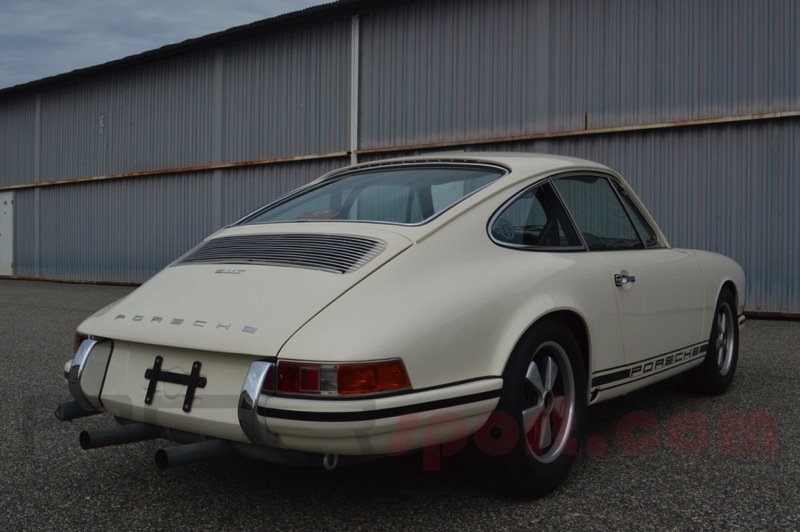 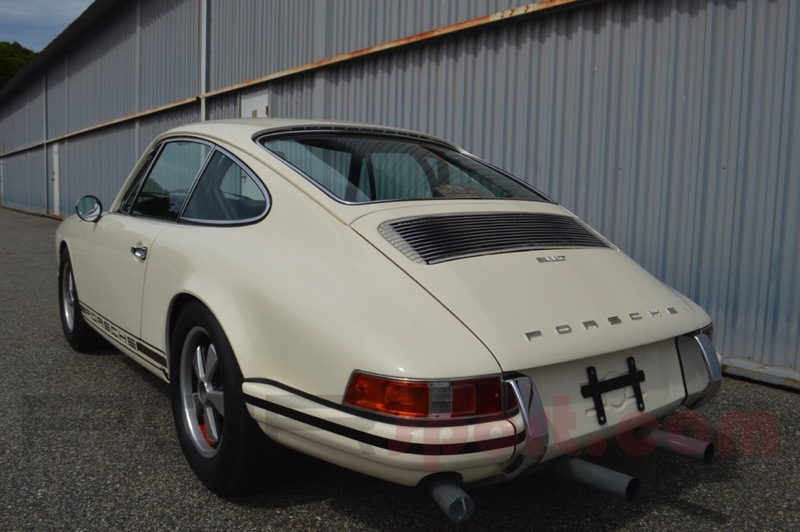 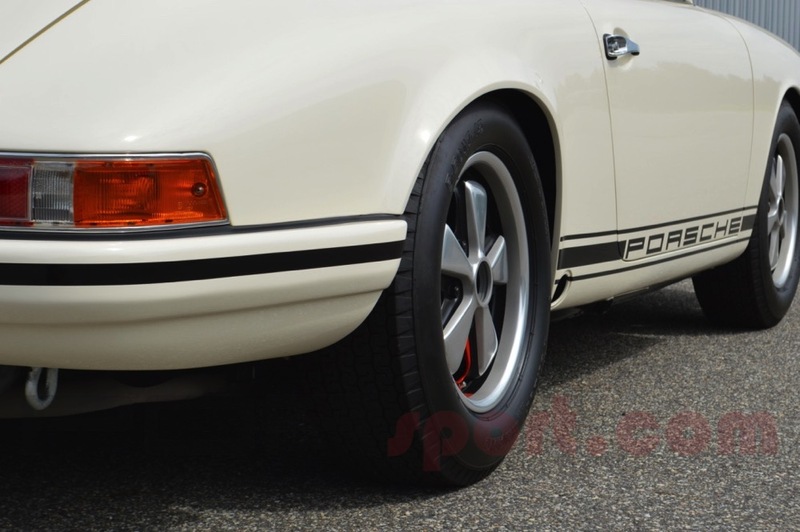 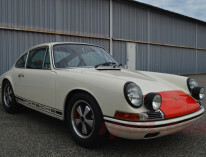 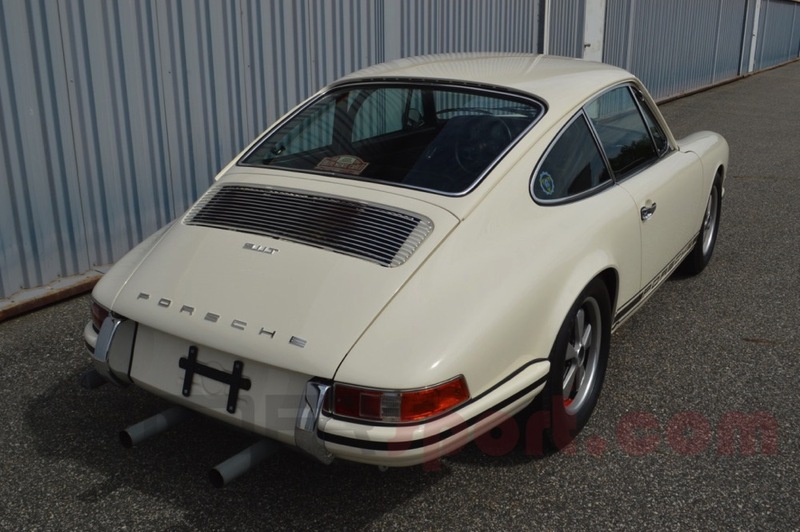 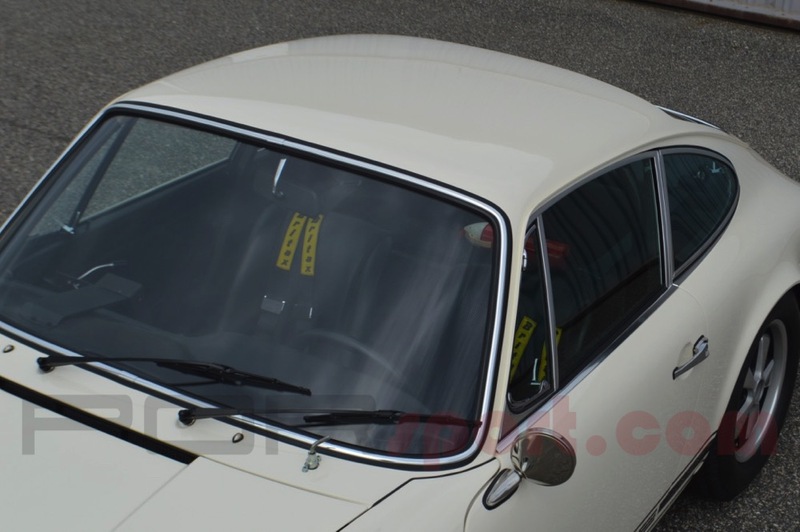 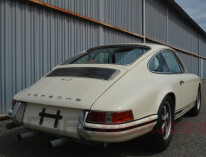 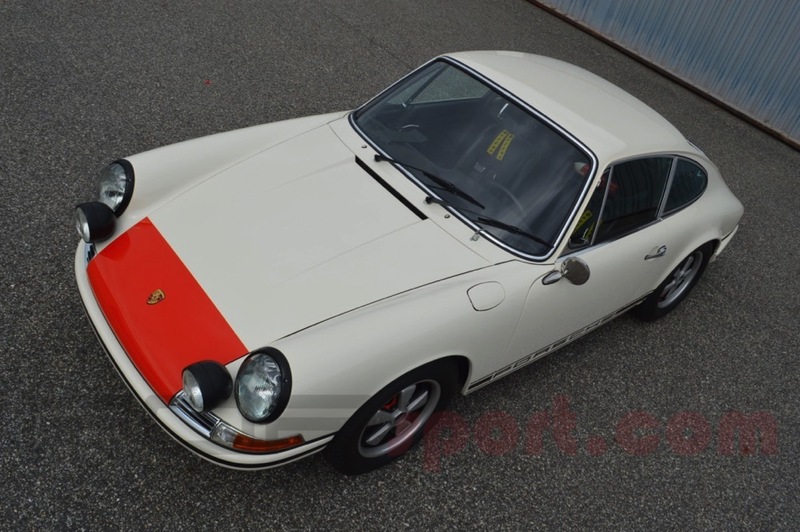 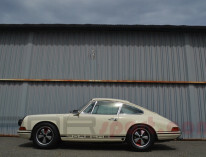 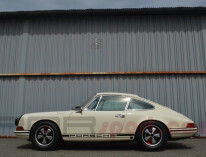 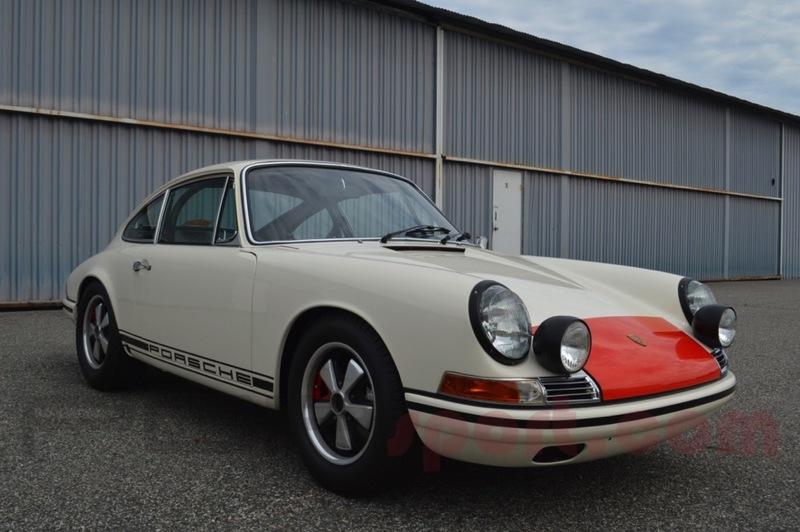 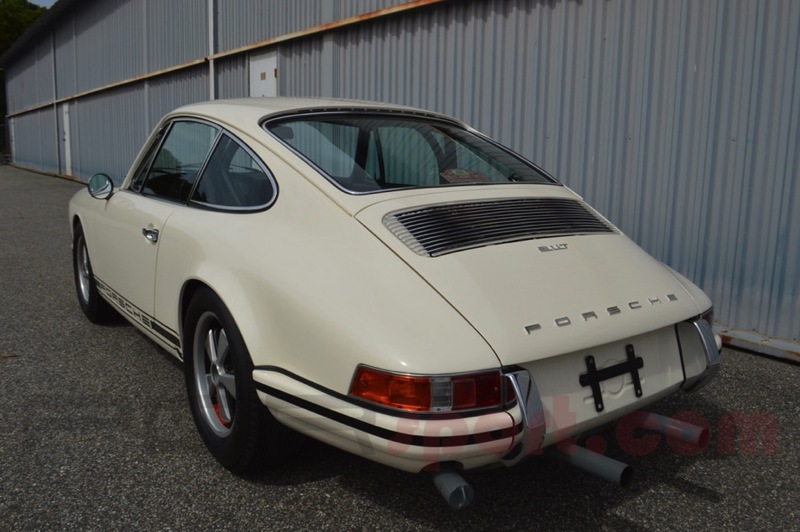 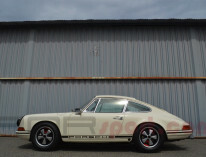 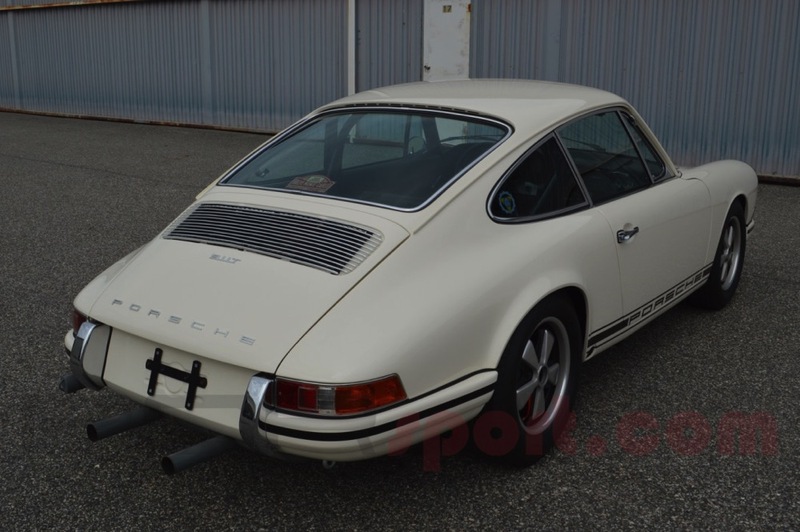 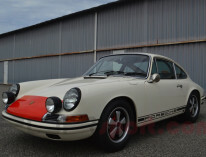 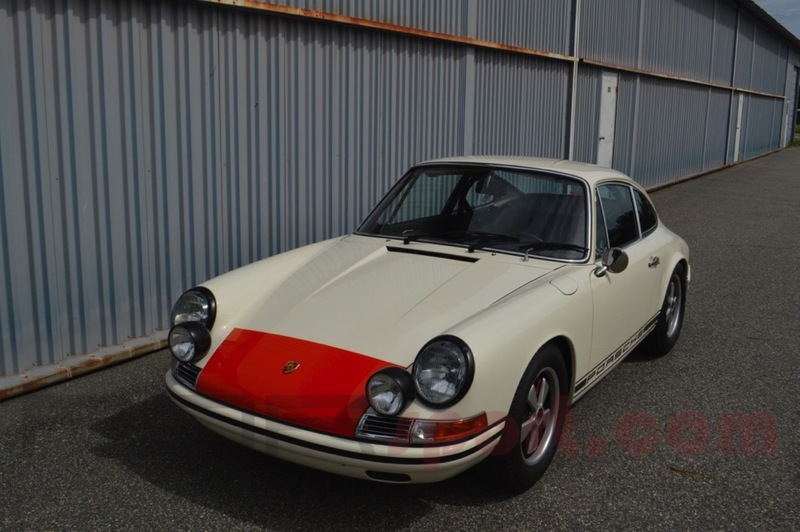 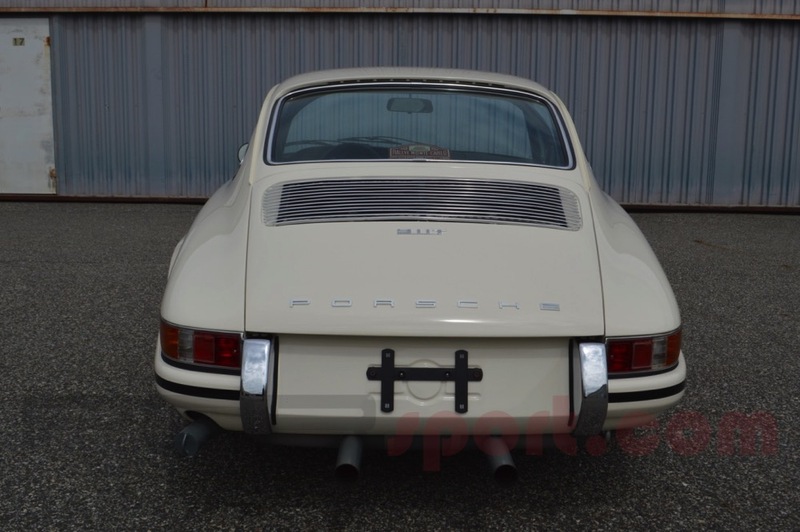 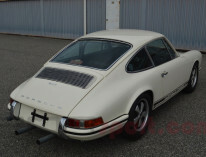 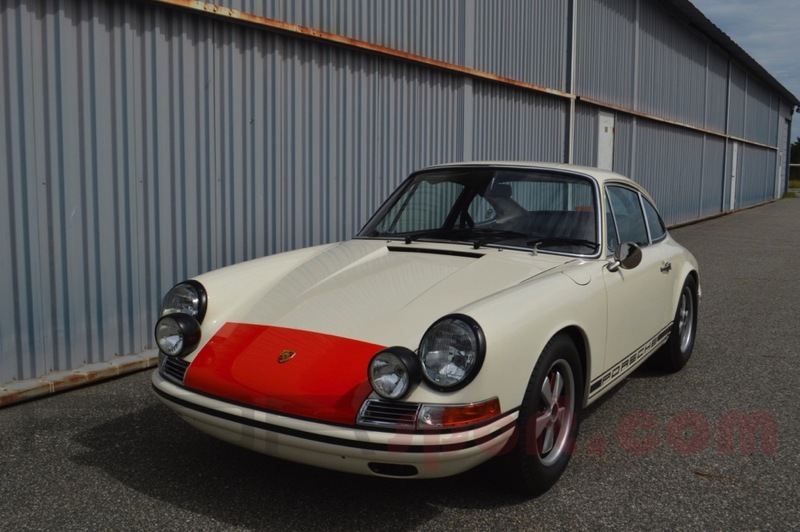 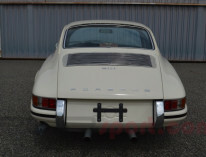 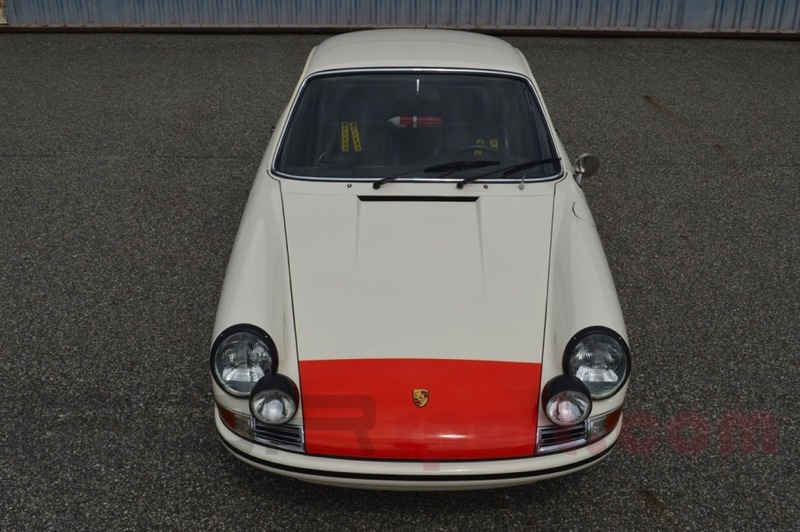 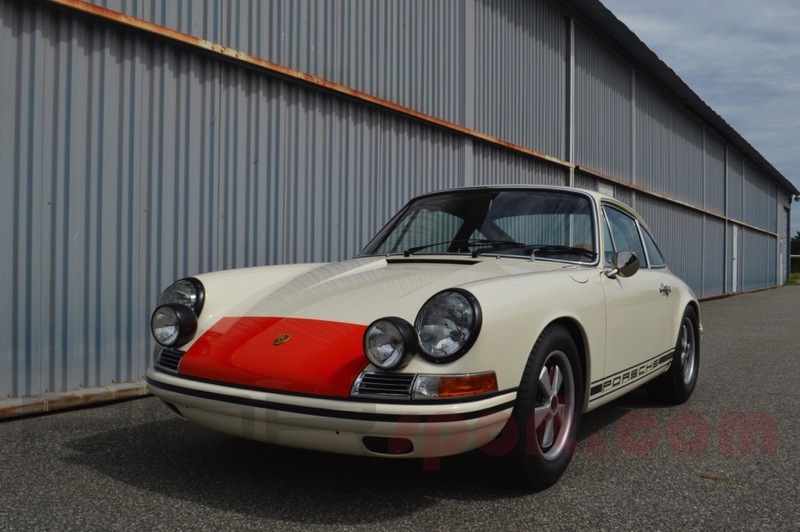 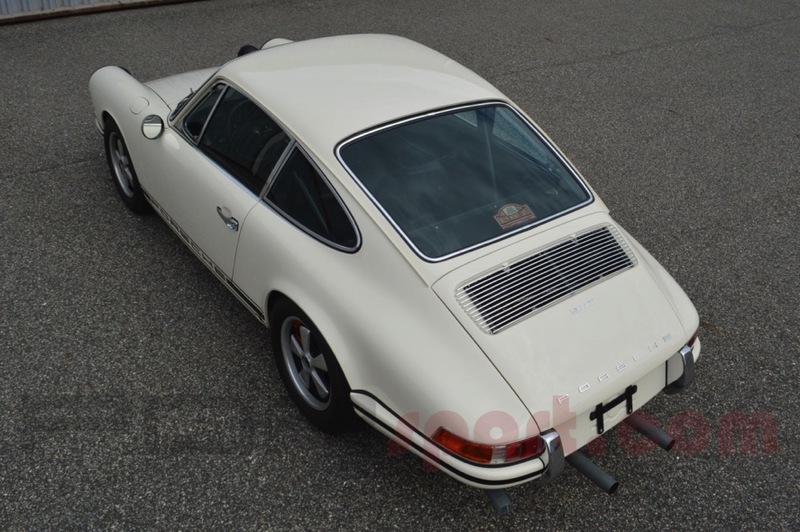 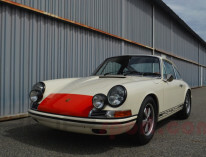 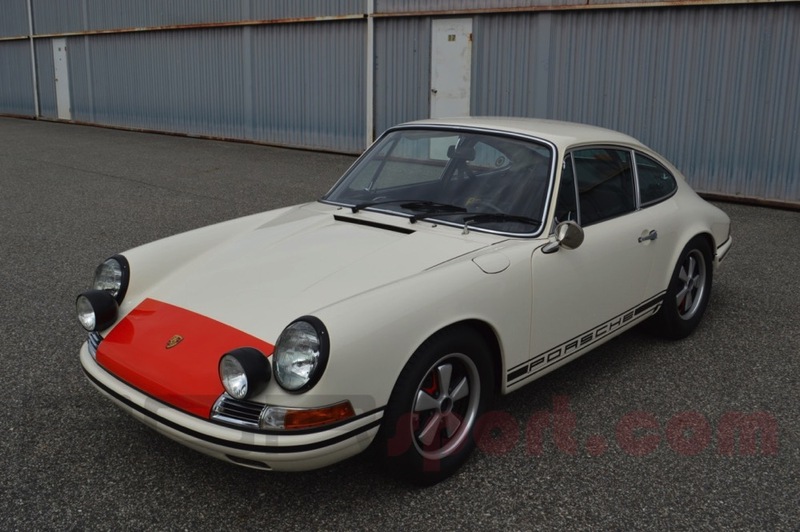 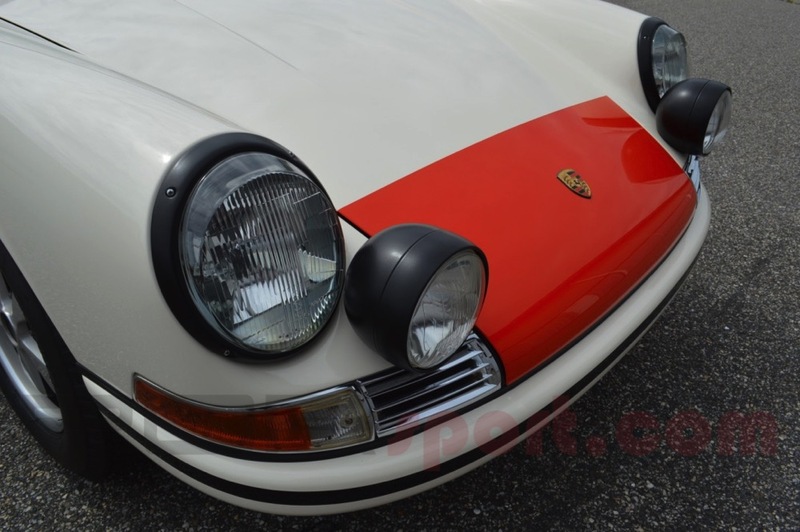 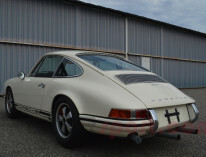 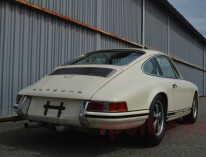 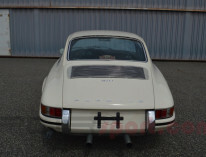 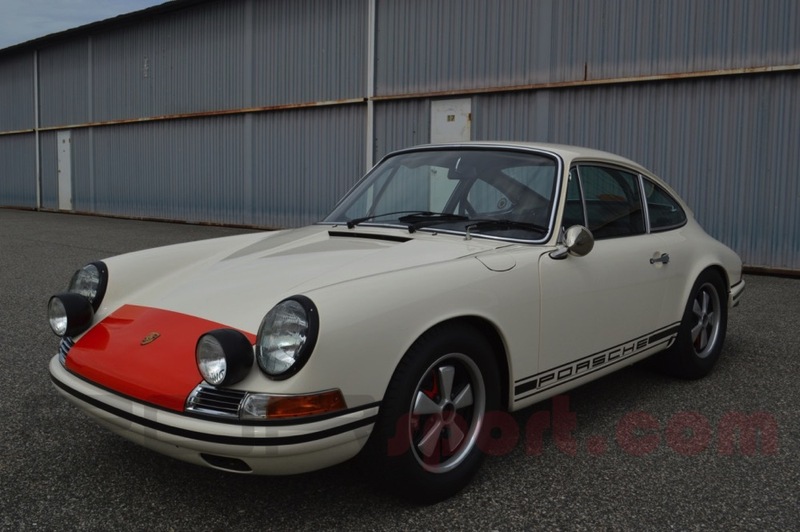 This 911T left the Porsche Factory in Light Ivory with black interior, LSD, Koni suspension, S instruments and oil tank, tinted glass and fresh air blower. 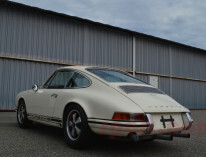 Added options include roll bar, 100-liter fuel tank, front skid plate, Recaro bucket seats, 6” and 7” R wheels, Marchal air horns, Cibie lights and outside thermometer. 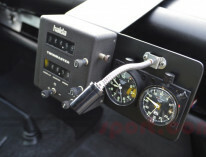 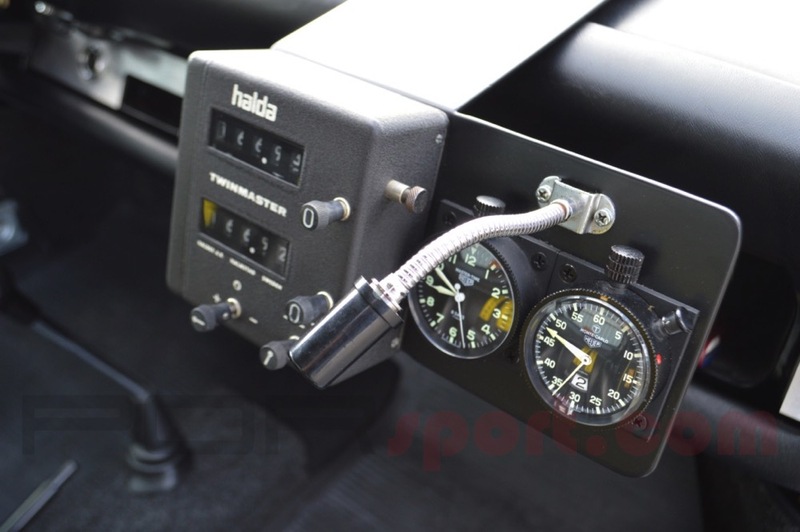 A proper metal case halda Twinmaster and a pair of NOS genuine Heuer watches are fully operational.The 911 is powered by a documented factory built Group 3 “2000 S” Ex Targa Florio engine that features 906 pistons and cylinders, 906 cams, titanium connecting rods (now on the shelf, replaced with Carrillos), 911 R tall magnesium manifolds, 46 Webers with rain tables and a 3 outlet rally muffler. 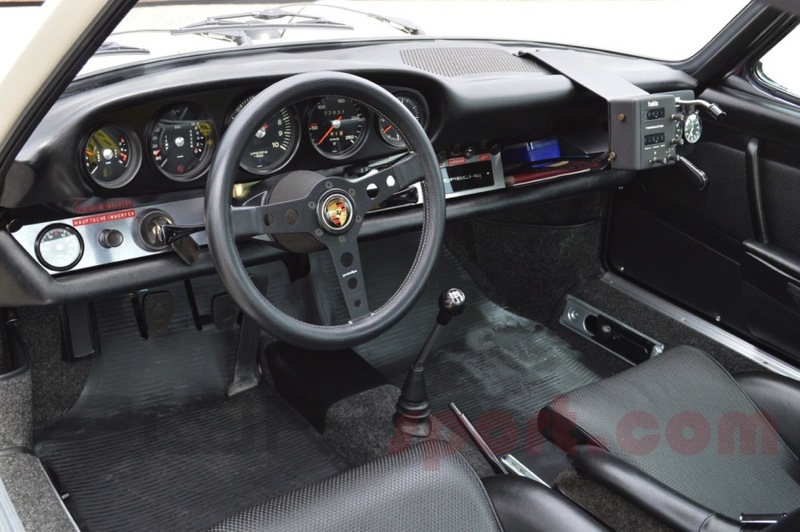 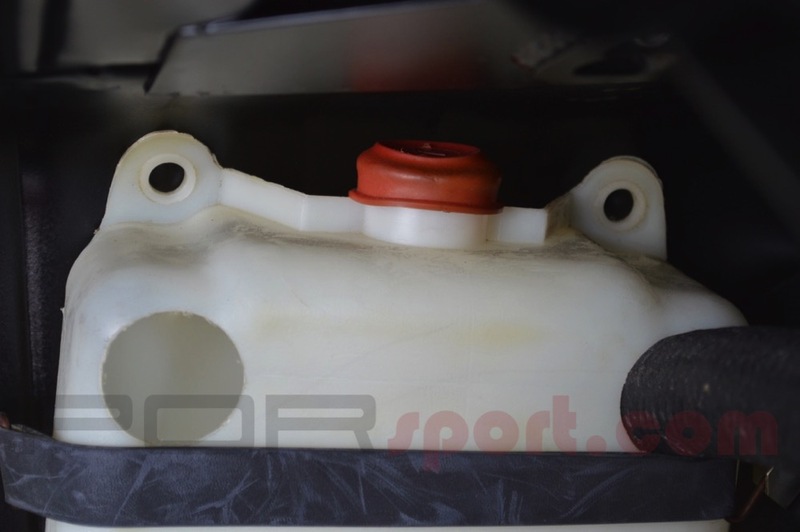 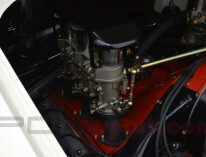 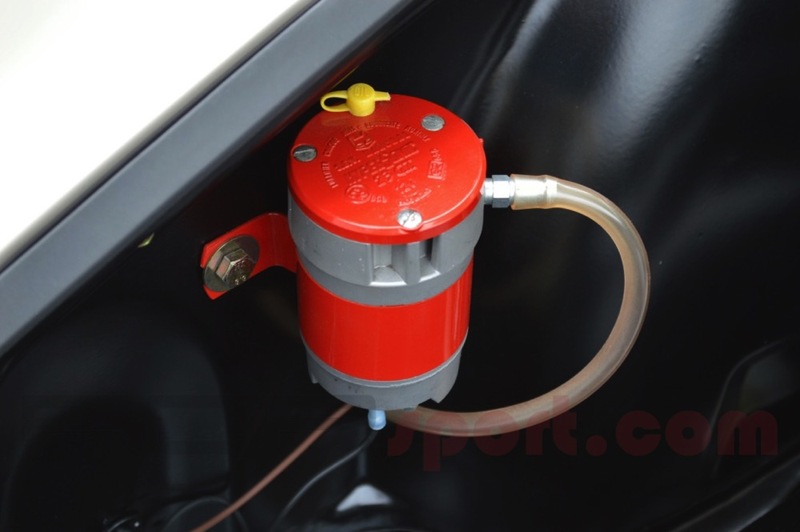 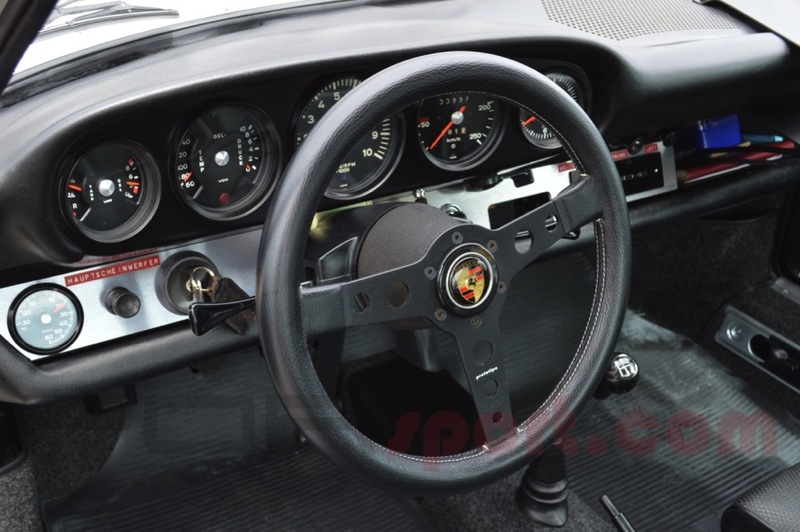 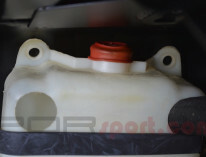 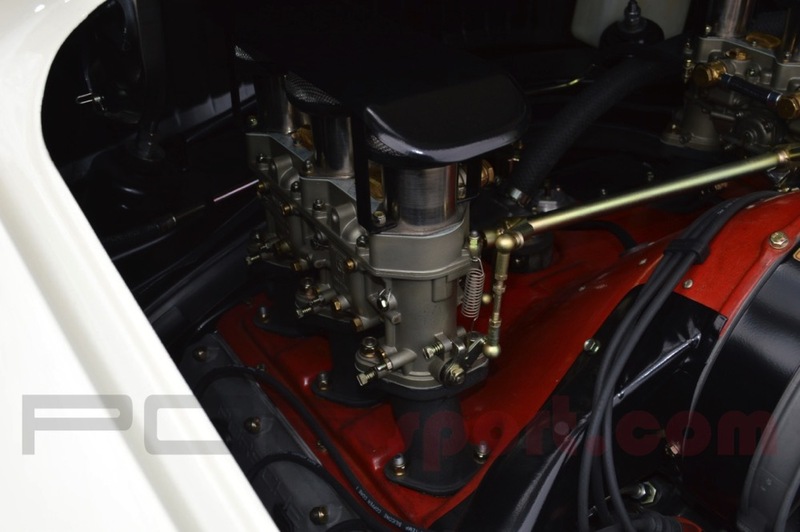 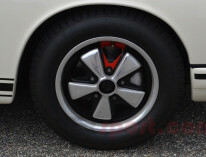 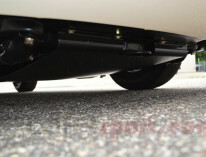 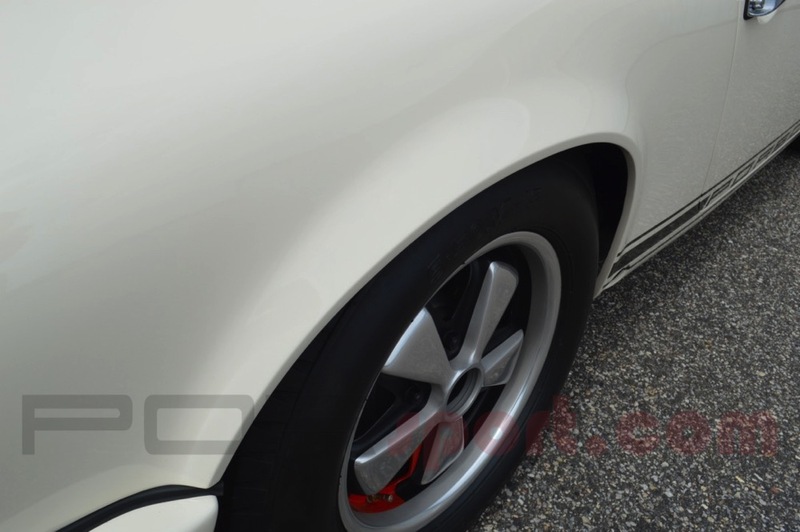 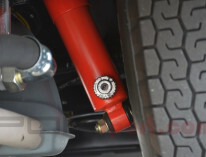 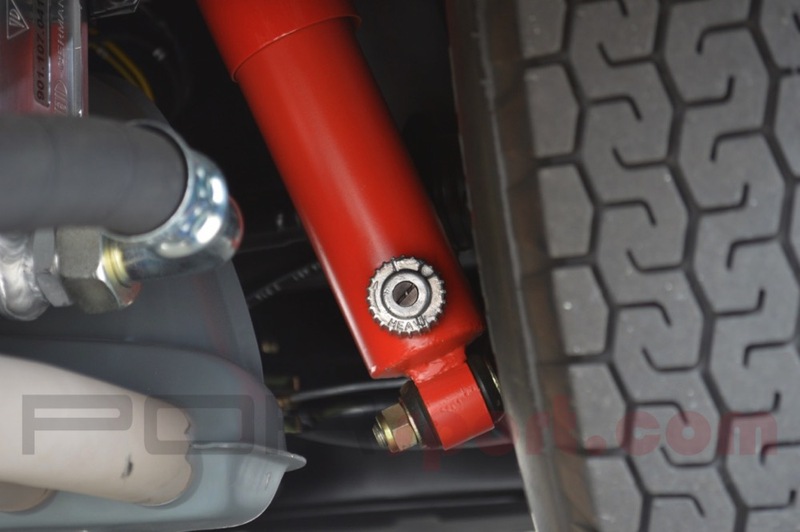 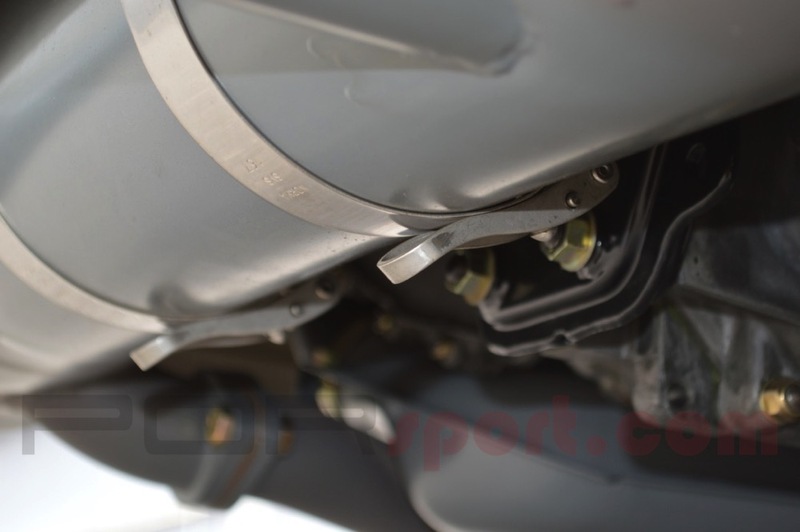 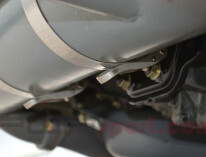 The gearbox is built on a special 928# “non-standard gears” case and houses a limited slip differential. 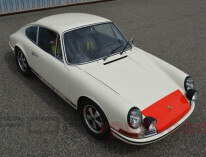 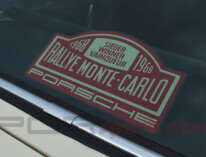 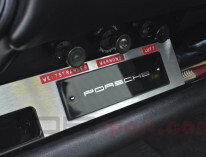 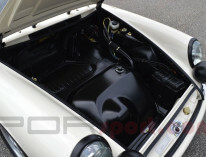 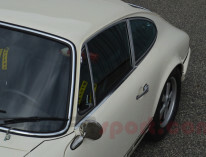 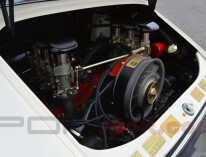 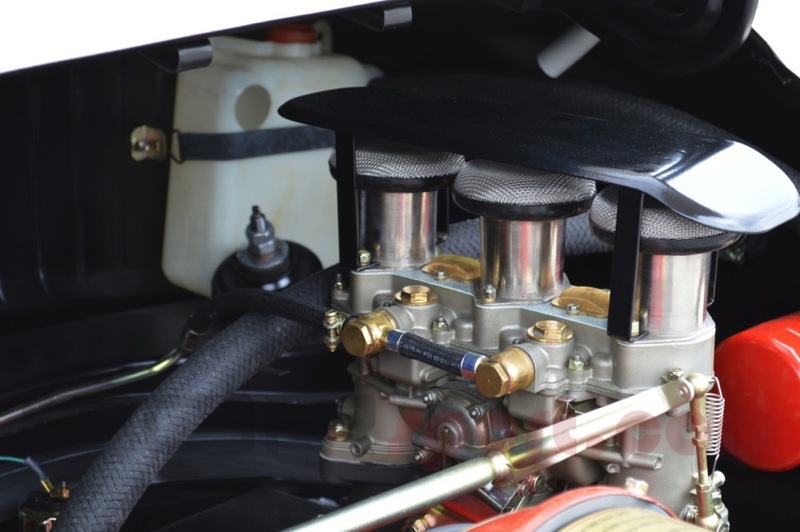 Only original Porsche factory race and NOS parts were used throughout this no expense spared restoration. 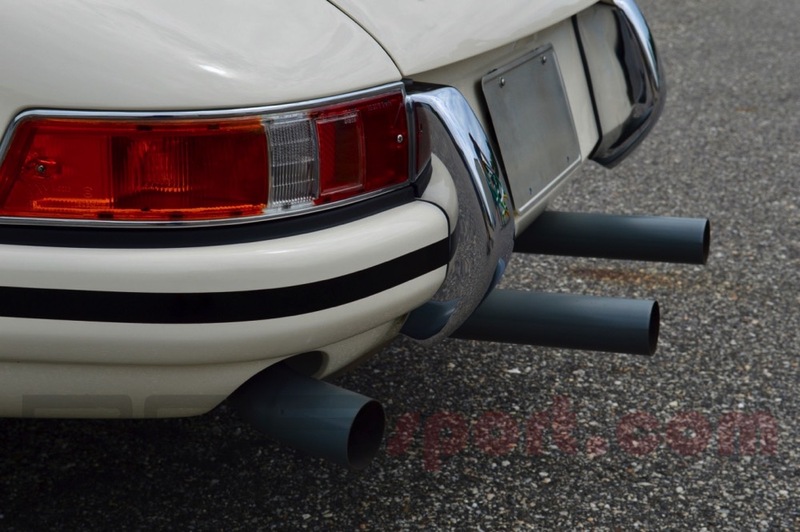 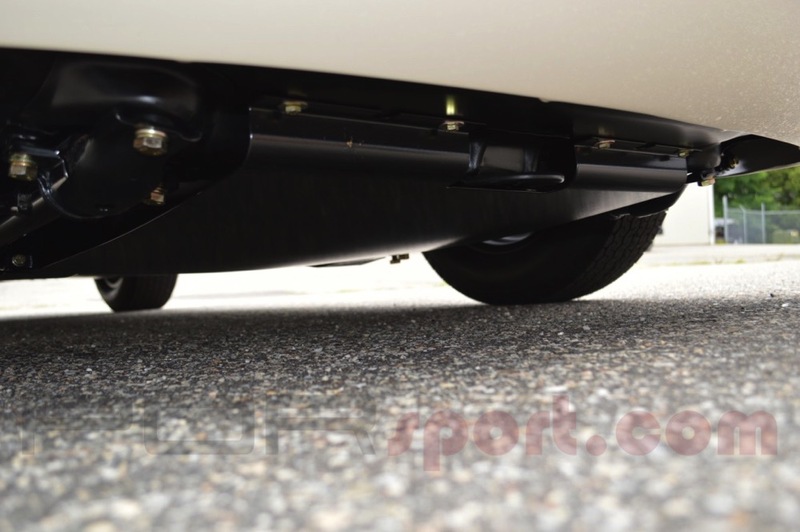 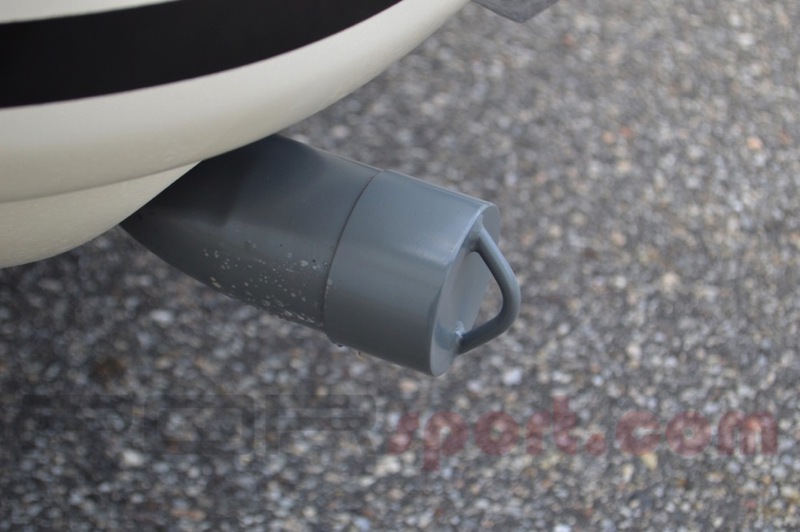 There are no significant reproduction parts on this car. 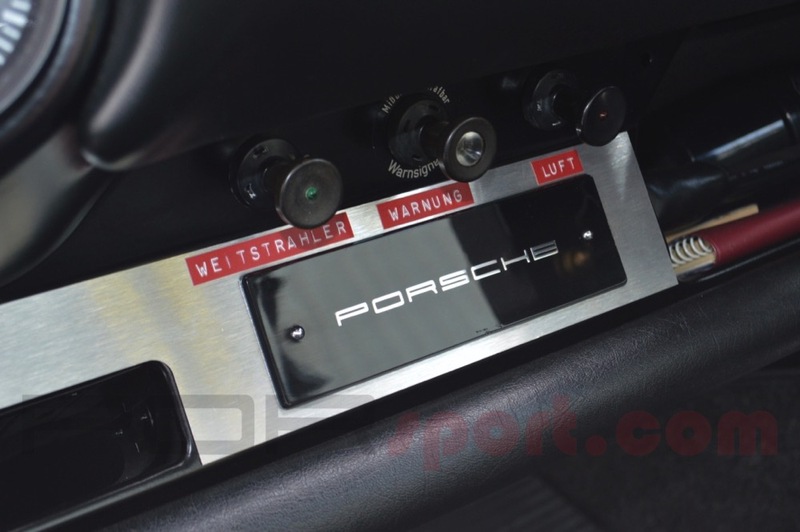 The level of detail and the quality of this car is second to none. 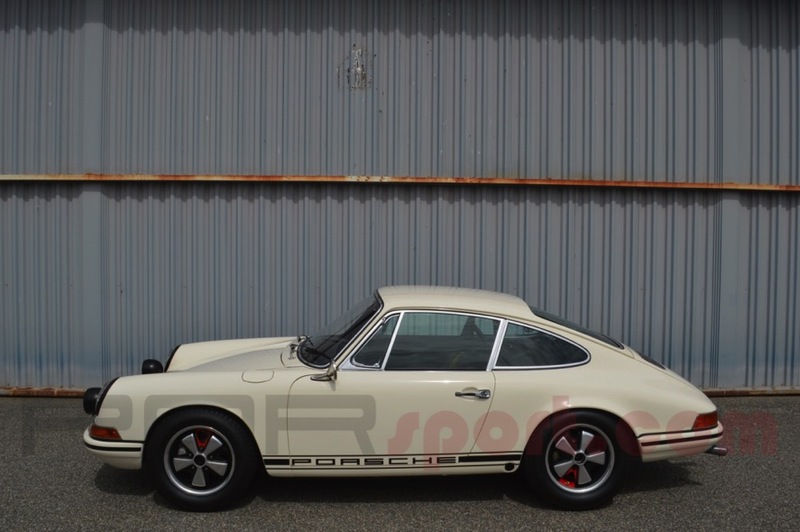 Likely the best of its kind. 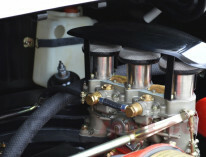 Selling some of my personal street gems in my collection to make way for more historic race cars. Top 1% Porsche.